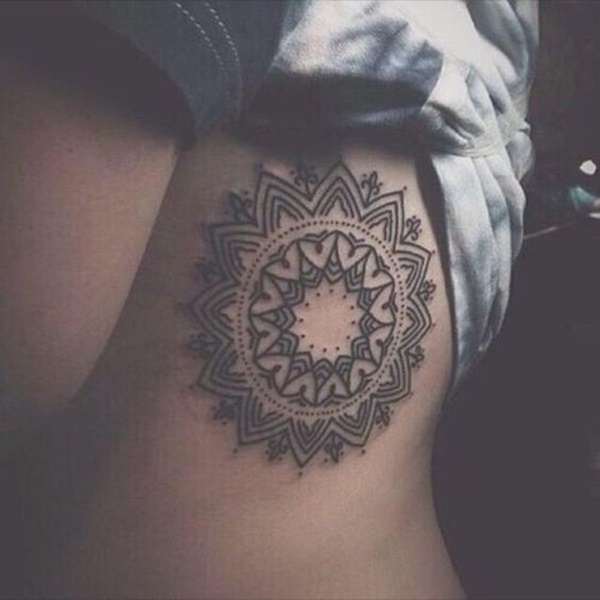 Mandala designs are symbolic and meaningful. In addition to representing the universe and various religious concepts, mandalas serve as a form of art because of their well-balanced and intricate patterns. 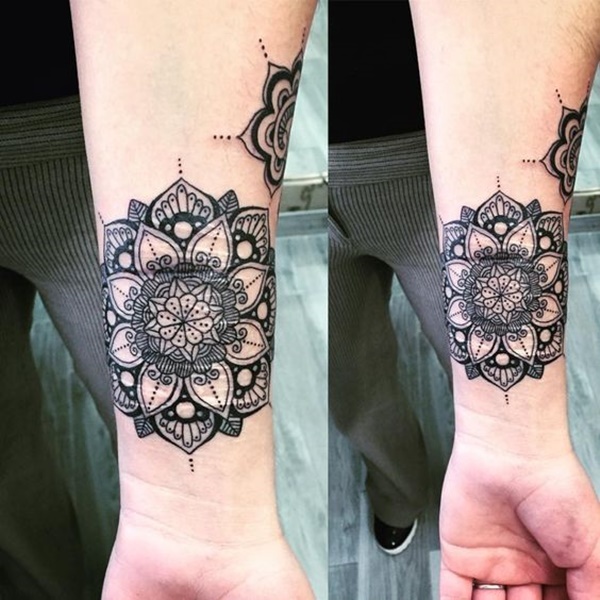 Mandala tattoos looks aesthetic and pleasing to the eye. They consist of geometric figures, including layers of circles and squares. The harmonious presentation of shapes creates visually striking designs that symbolize unity, balance, and peace. Just looking at a mandala tends to create a sense of relaxation and mental clarity for those who use it to strengthen their spirituality. 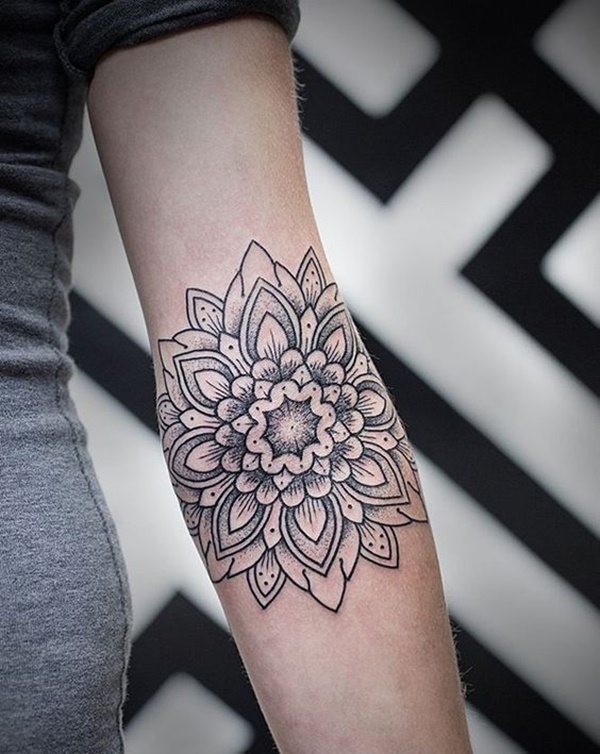 When deciding to ink yourself with a mandala tattoo, it’s a good idea to select particular shapes, patterns, and color palettes that hold special meaning in your life. For example, you may want to add a memorable quote, a favorite color, an animal that represents your personality, or other unique elements that personalize your tattoo. 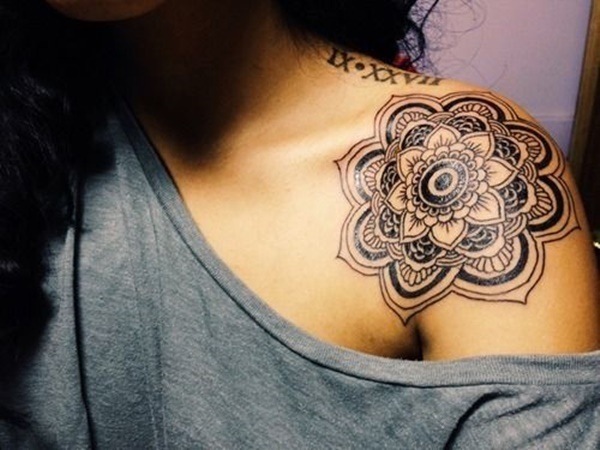 Whether you’re interested in mandala designs to boost your spirituality or simply to appreciate their breathtaking beauty, you’ll find something inspirational from this compilation of 100 stunning mandala tattoos. 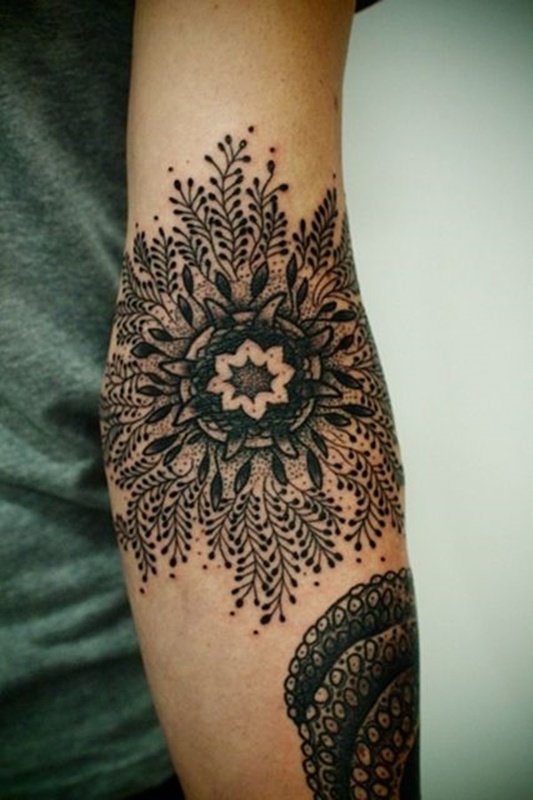 Black wavy spikes jut outward, while the central circle and surrounding petals are inked in red in this dotwork tattoo. 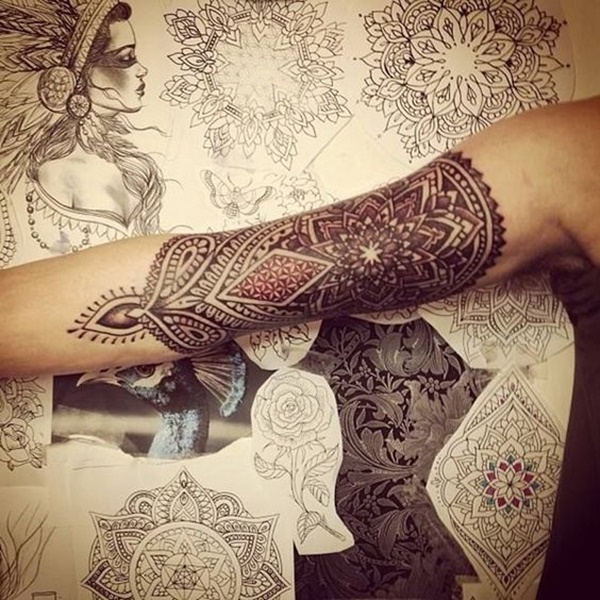 This arm sleeve features a combination of geometric, dotwork, and blackwork styles. The centerpiece of this mandala is a realistic rose adorned by line work petals and dotwork bead accents. 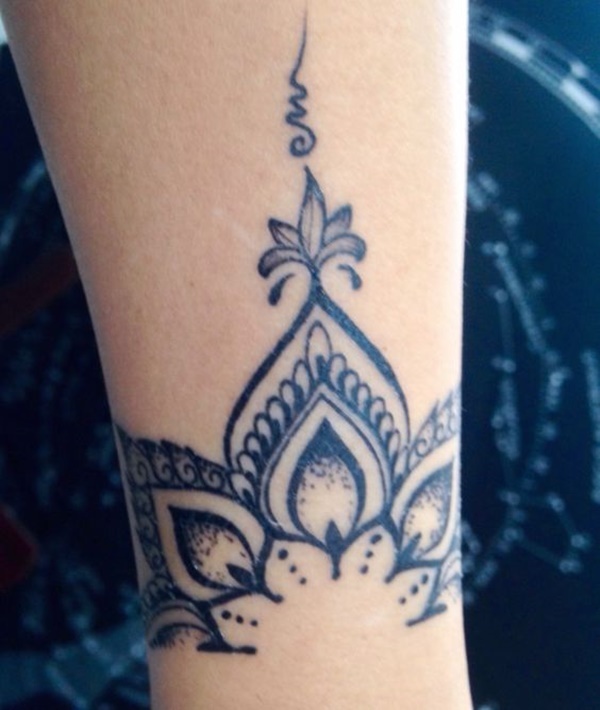 This line work tattoo looks delicate and gives off a feminine appeal. 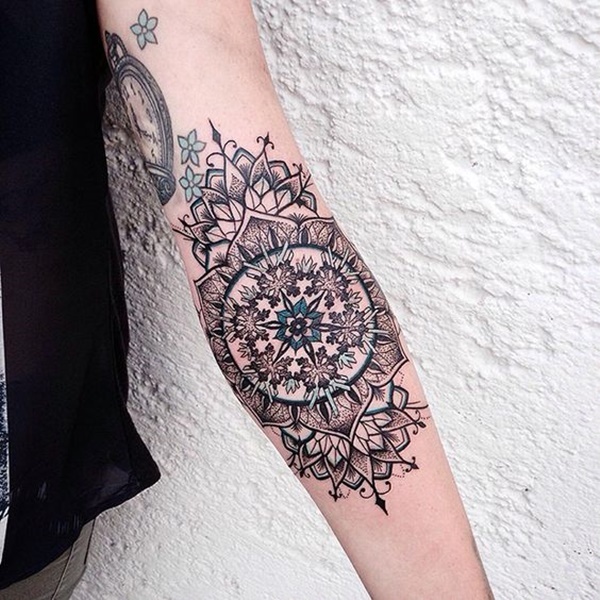 Bold shading and intricate patterns characterize this beautiful mandala. 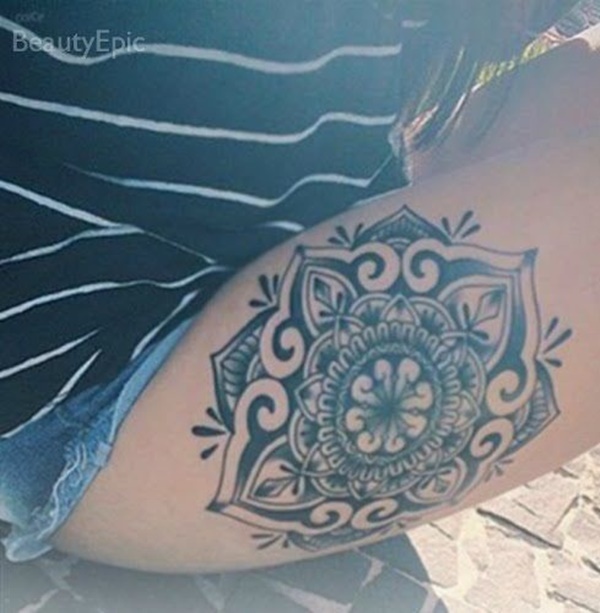 Running from the thigh down to the ankle, this elaborate black mandala tattoo showcases ornate floral details and bold shading. 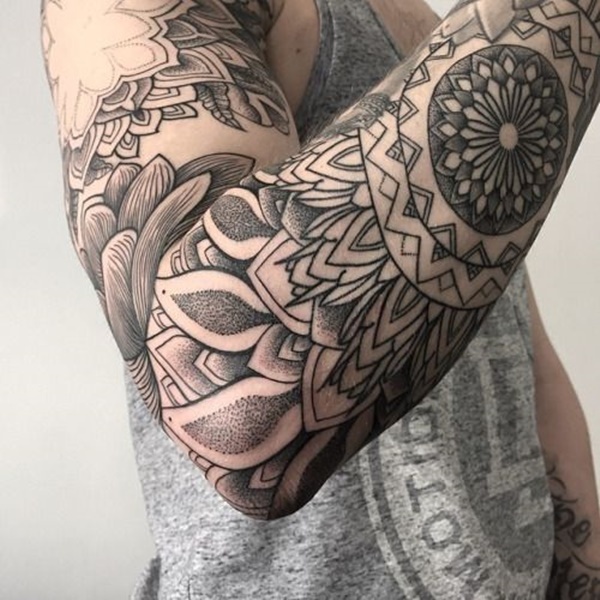 The inner area of the elbow is inked with a geometric mandala, while the rest of the arm sleeve shows off tribal patterns. Elephants symbolize wisdom, power, and strength, and they are well-revered in some cultures and religions. 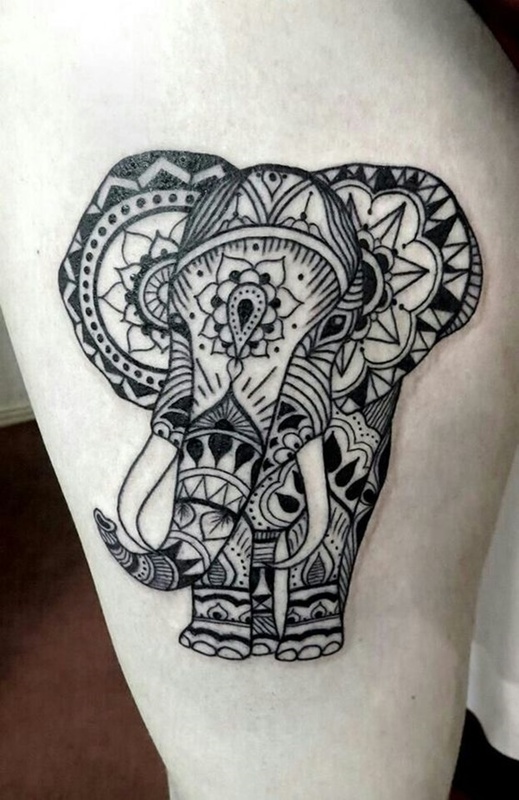 The mandala motif perfectly complements this elephant tattoo, as mandalas represent the circle of life and hold a sacred meaning. Dotwork shading create dark silhouettes on the edges of the petals. 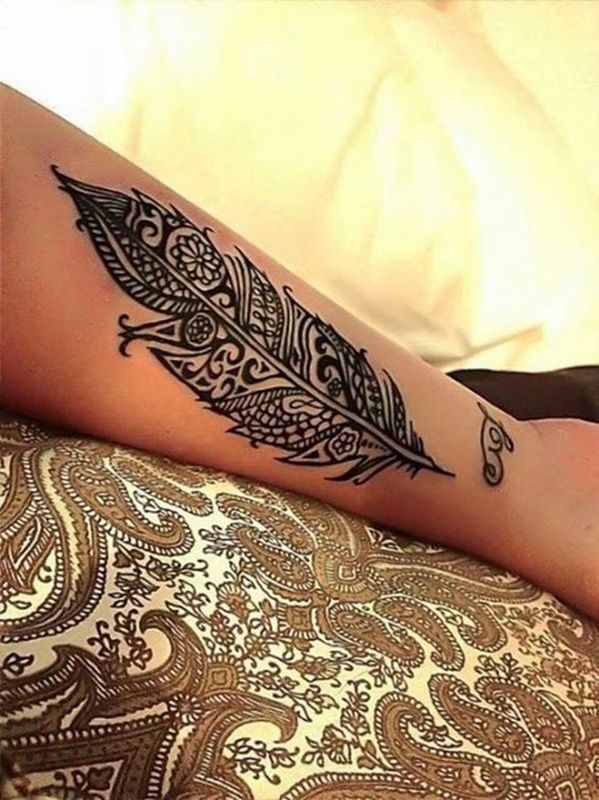 This black tattoo features the shape of a feather. 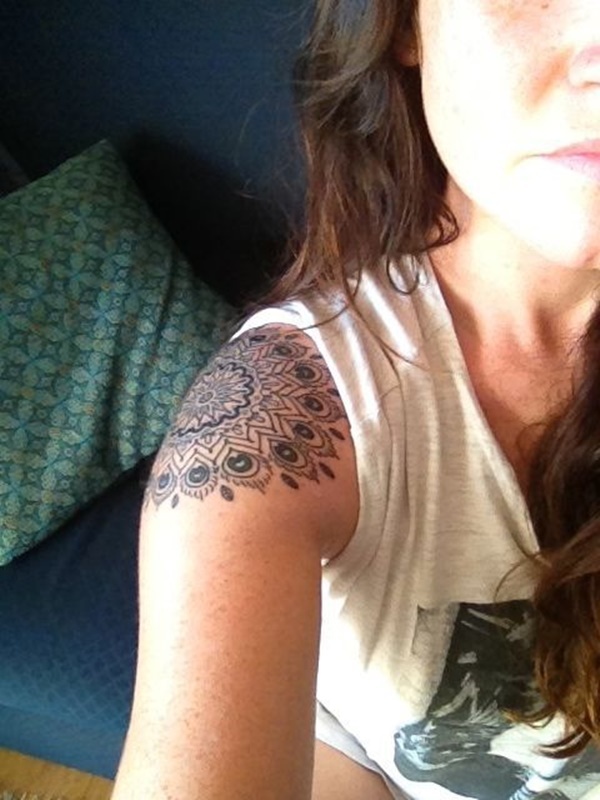 This mandala tattoo stretches atop the shoulder. 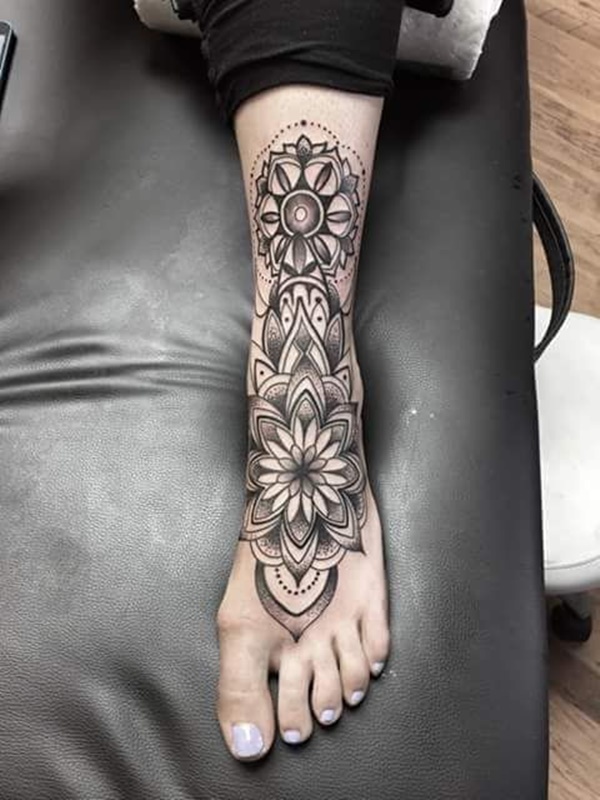 Characterized by dotwork style, this tattoo shows a smaller upper mandala that connects to a larger lower mandala on the foot. 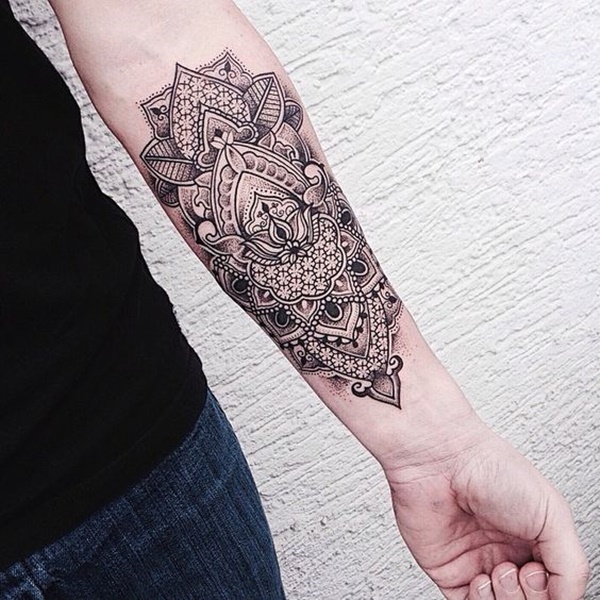 This meticulously crafted mandala has complex details and fine dotwork shading. 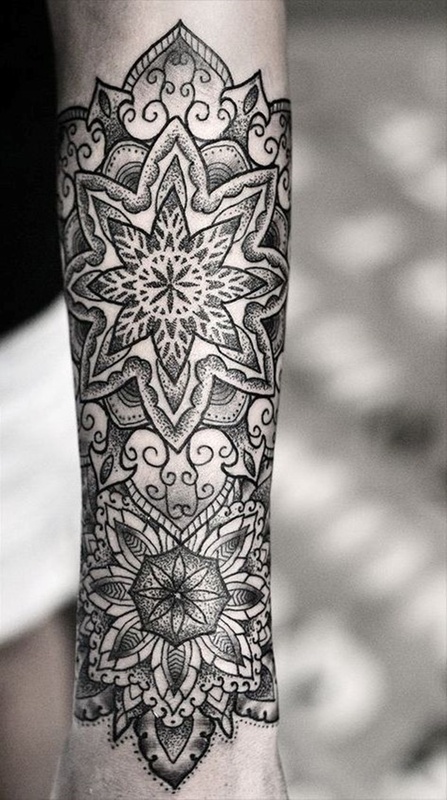 This black and grey arm sleeve contains a variety of designs, with a large mandala covering the entire length between the elbow and arm. Light green and blue colors breathe life into this geometric mandala. 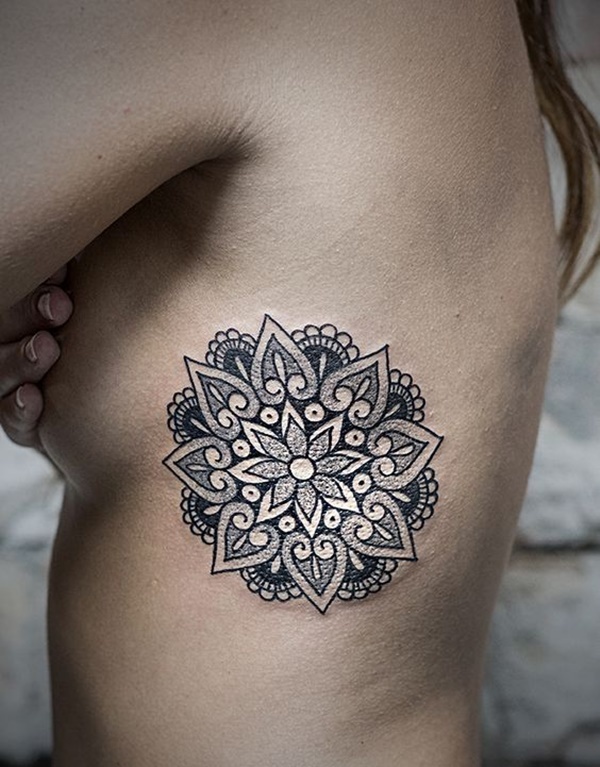 Outlining the shape of the chest, this seductive dotwork mandala oozes with appeal and femininity. 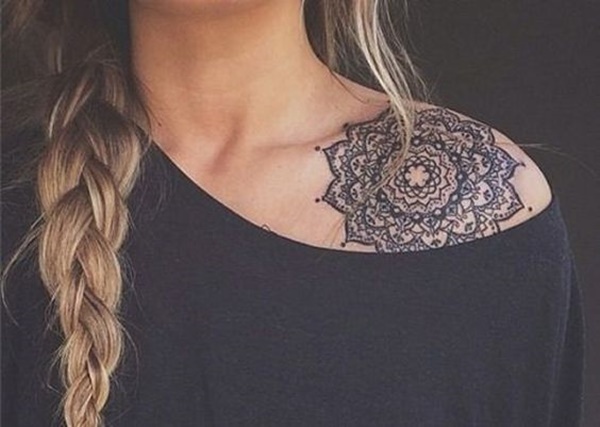 A small line work tattoo covers the shoulder. 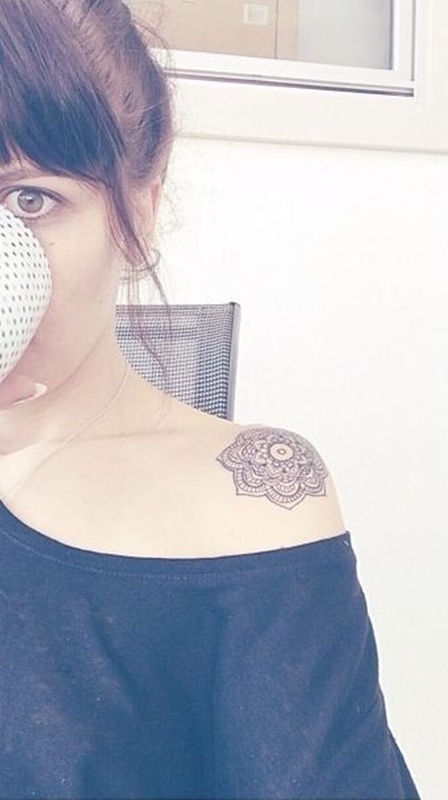 This creative black dotwork tattoo shows two halves of mandalas. Straight lines separate the designs, creating a gap in between. 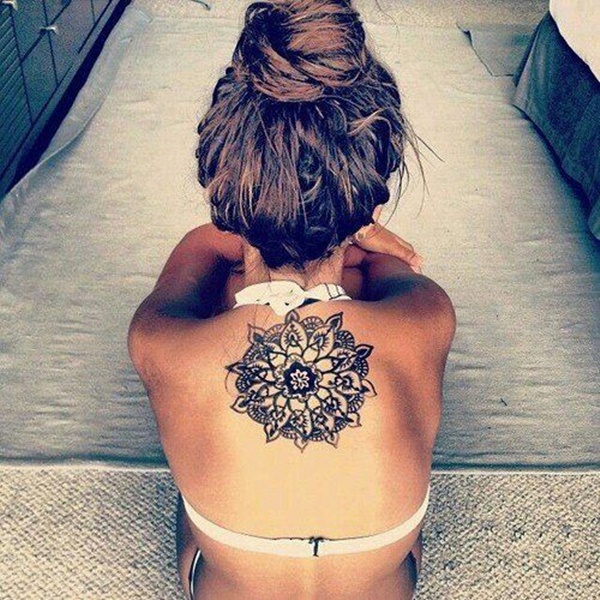 Mandalas, which mean “circle,” are best inked on flat areas of the body, especially the back, to fully showcase their beauty. This blackwork mandala preserves its circular shape and clearly displays its proportion. 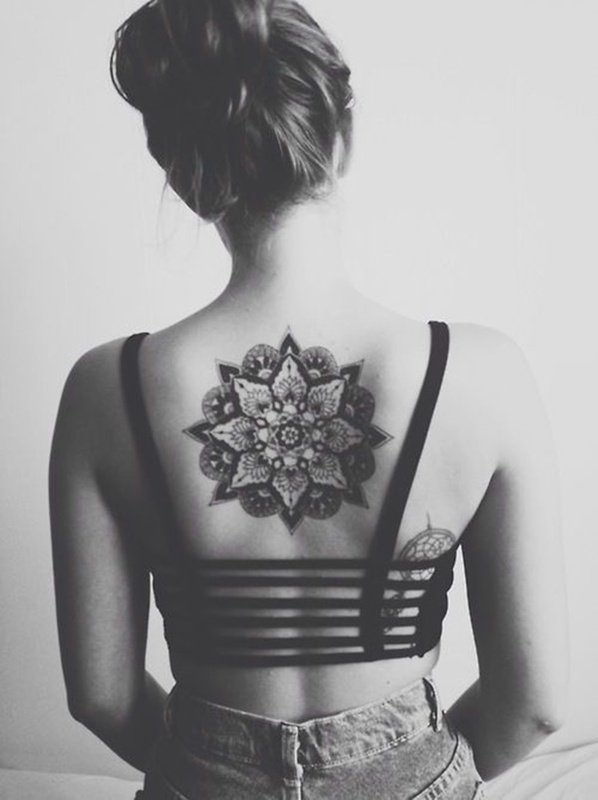 Depicting a lotus bloom, this mandala looks alluring on the back. This black line work tattoo looks small and less noticeable. 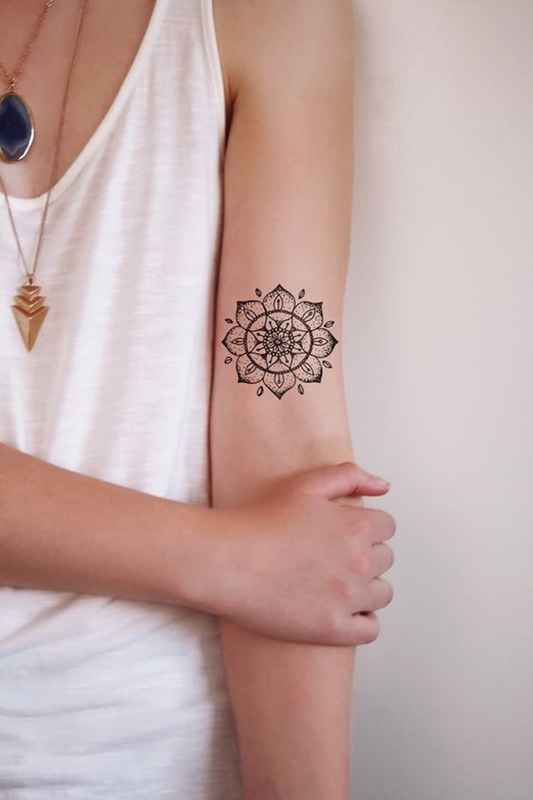 If you want a tattoo that doesn’t steal glances all the time, it’s best to choose smaller designs and ink the tattoo on less conspicuous parts that can be hidden with clothing, like the shoulder or ankle. 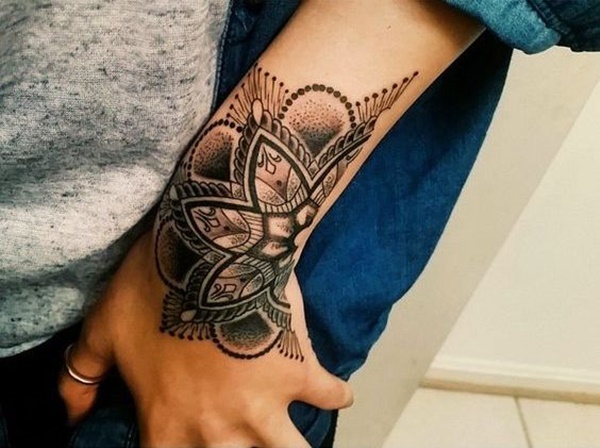 This line work tattoo looks clean and well done. 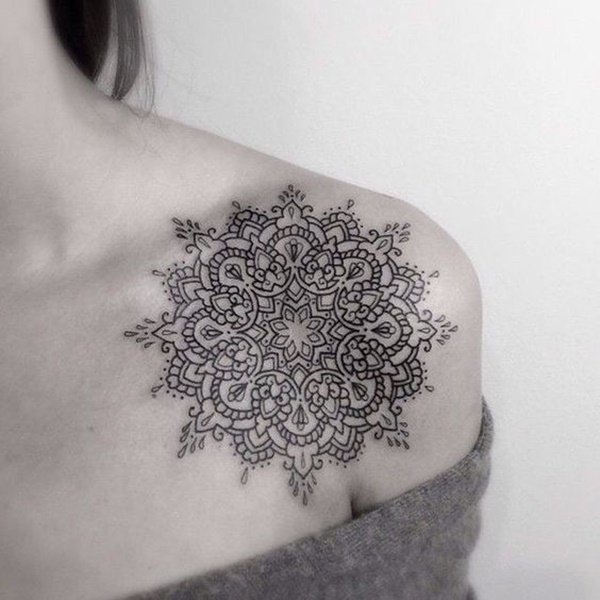 Primarily displaying the shape of a flower, this dotwork mandala has a feminine appeal. The complex details of this mandala stand out thanks to the clean line work technique. Mandalas not only symbolize harmony and spirituality, they also look quite decorative because of their intricate details. 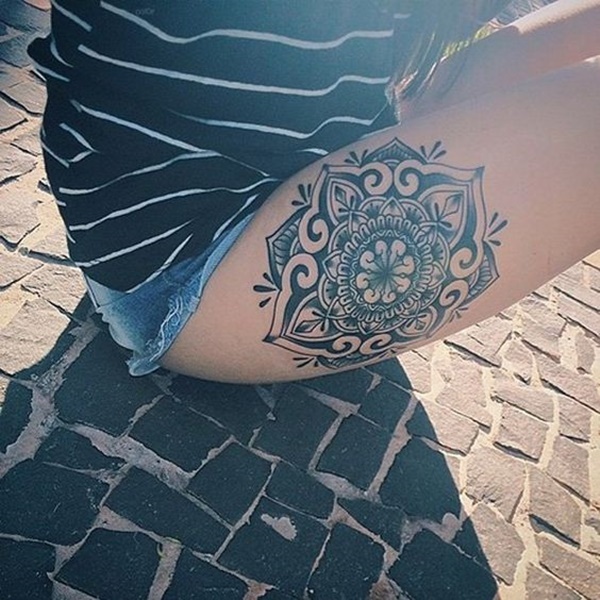 When placed on the chest, leg, or thigh, mandala tattoos look rather alluring. 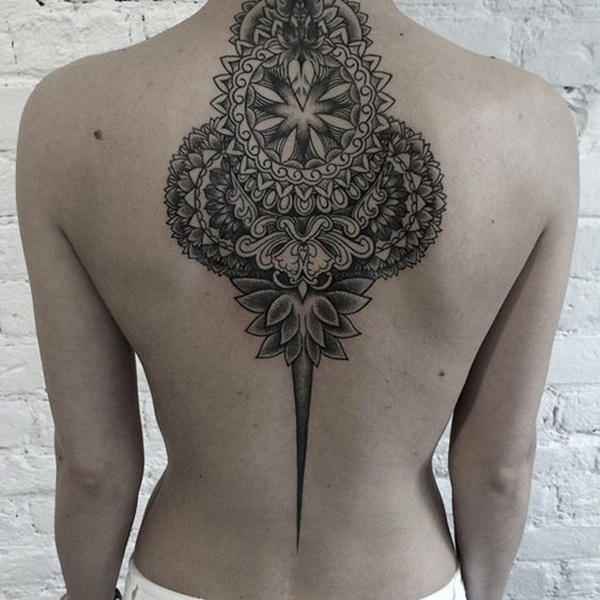 A pointed end runs down the spine, while petals open outward at the bottom of this elaborate blackwork mandala. 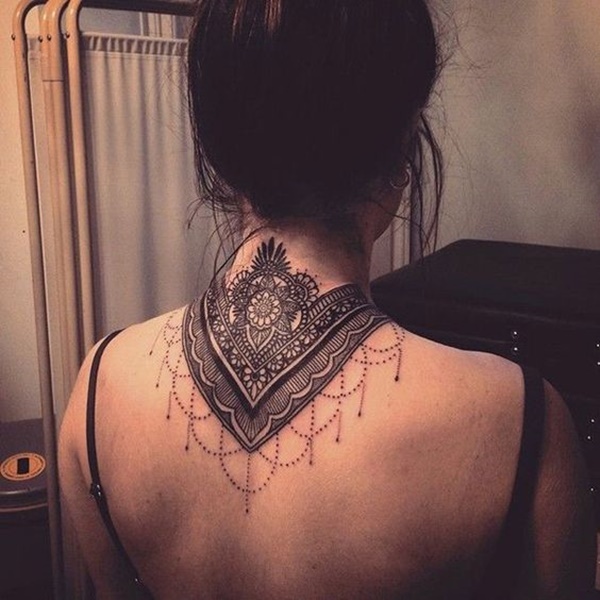 Dark shading and dotwork techniques distinguish the grandiose beauty of this tattoo, which is perfectly placed on the back. This medium-sized dark line work tattoo looks whole and non-distorted on the flank area. 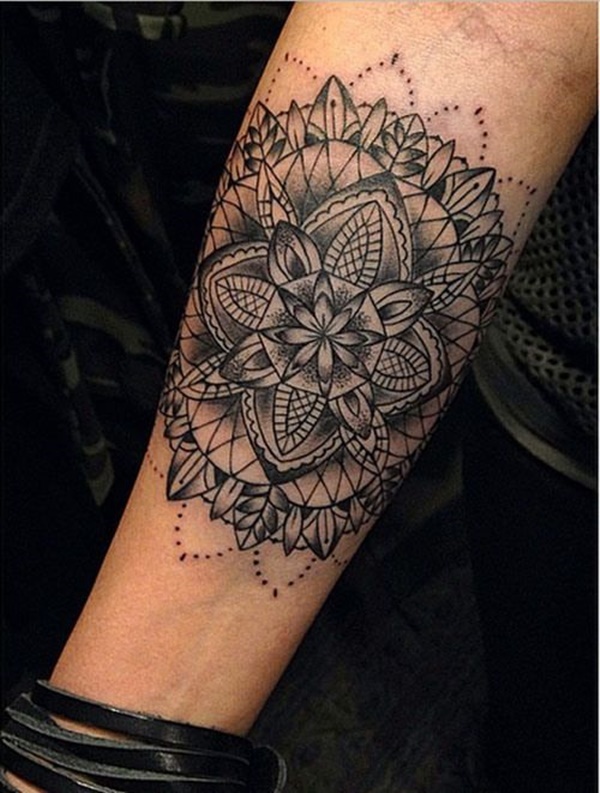 The centerpiece of this dotwork mandala is a geometric design that lends balance and proportion to the piece. This dainty mandala beautifully embellishes the back and looks like an ornamental accessory. 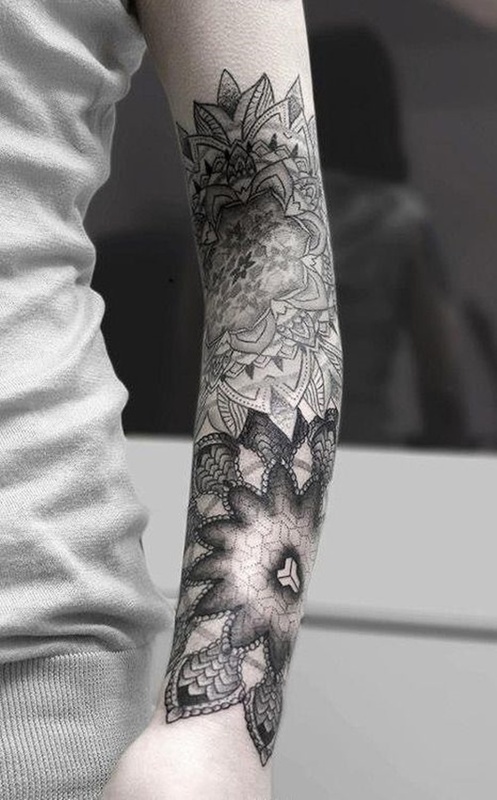 This black and grey arm sleeve features multiple mandalas with geometric and floral centerpieces. 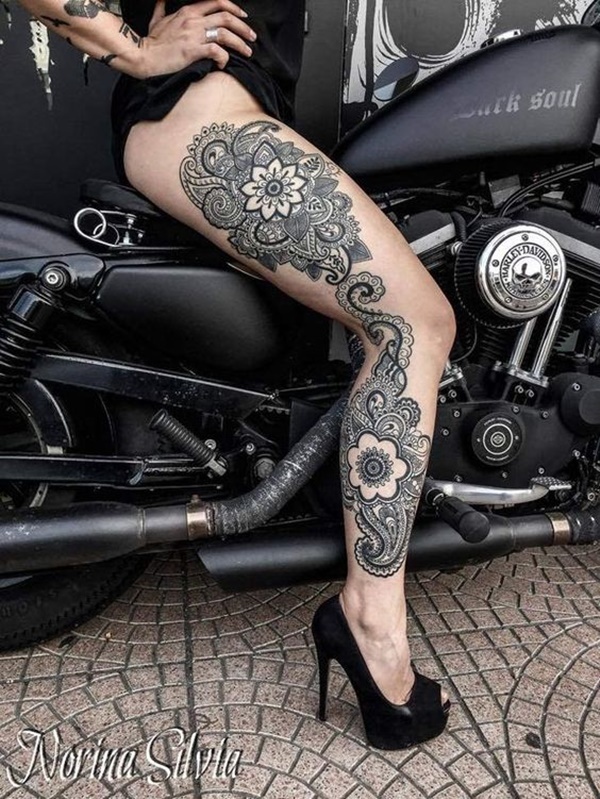 Beautiful line work accentuates the bold inner outlines and ornate details of this seductive thigh tattoo. This black line work tattoo leans more toward organic shapes. A delicate rose lies atop the dotwork mandala, and bead accents adorn the design. 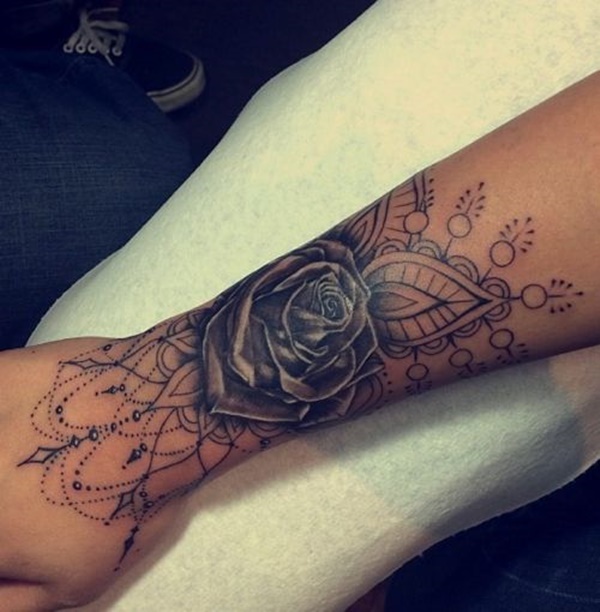 Fully covering the entire length of the arm, this black arm sleeve displays roses along with overlapping mandalas. 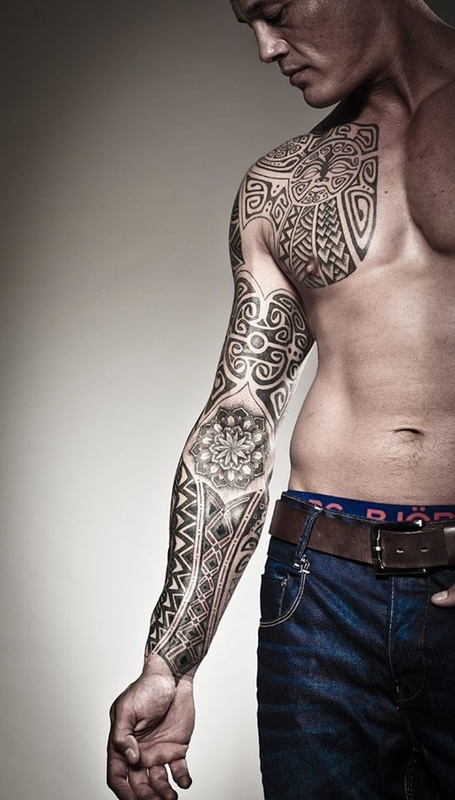 Full arm sleeve tattoos look dashing and attention grabbing. 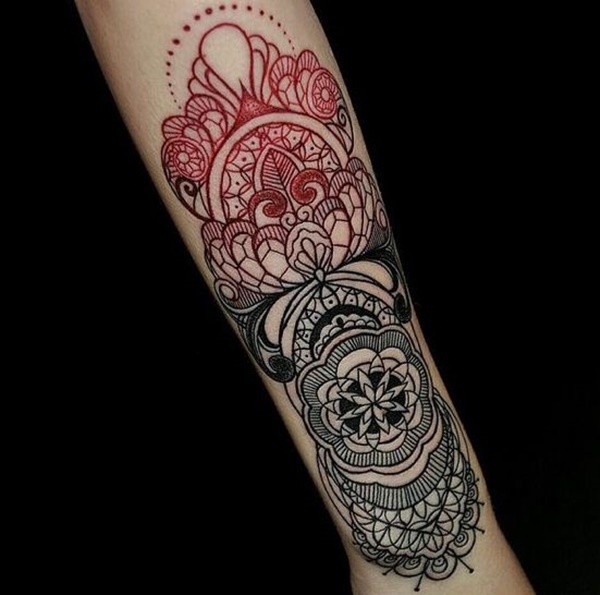 Stunning red dotwork blends well with the thick black outlines, making this tattoo look eye-popping and easily noticeable. 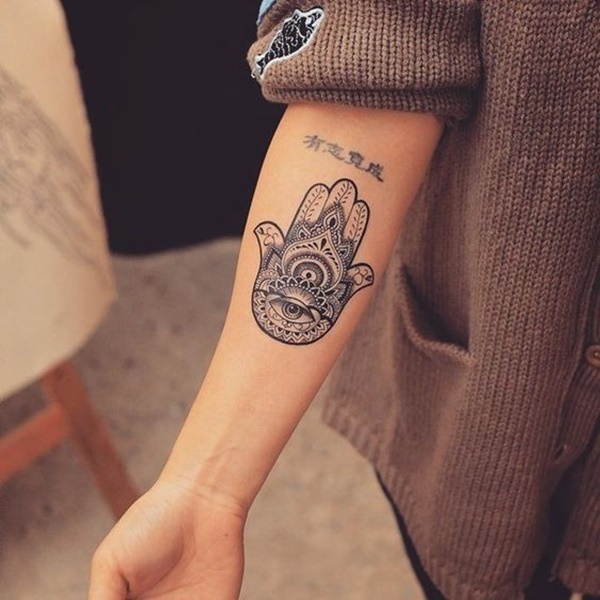 Hamsa tattoos feature a hand with an eye, which are symbolic elements that represent deep spiritual meaning. In some cultures, the eye is believed to be a symbol of a powerful being who sees all, while the hand serves as guidance and protection. 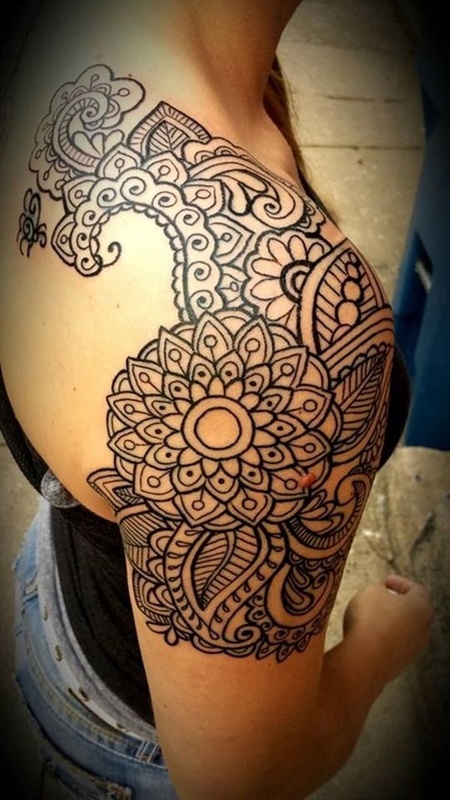 Decorative elements above and below this line work mandala add beauty to the design. 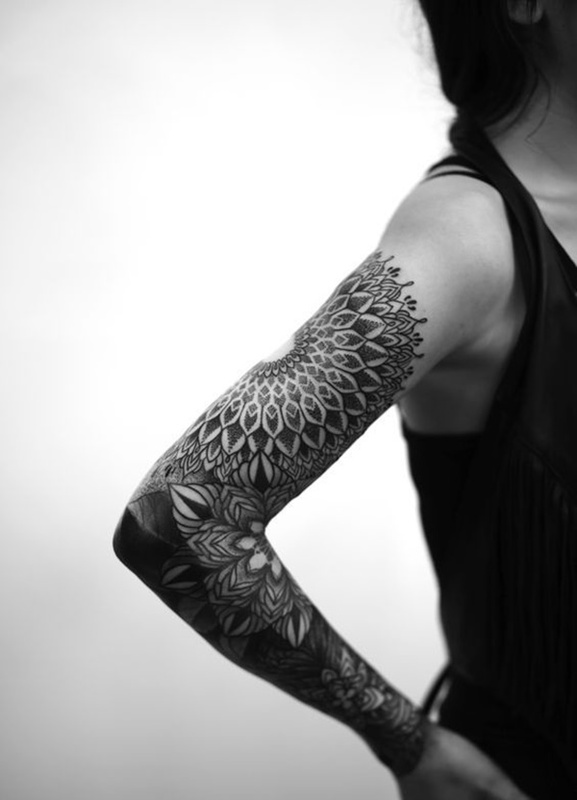 Dotwork tattoos require talent, experience, and hours of patience. 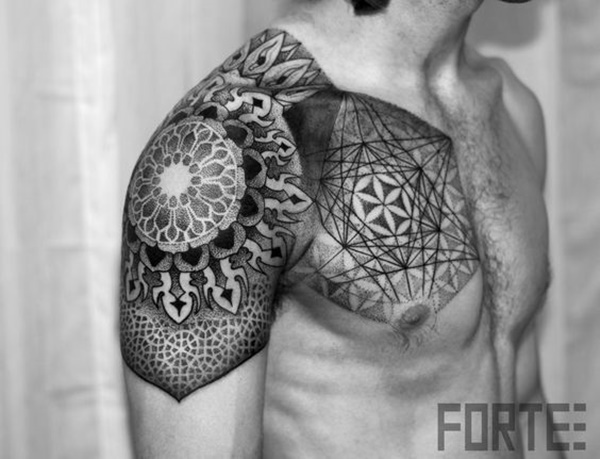 This nicely detailed mandala showcases the skilled craftsmanship of the tattoo artist. 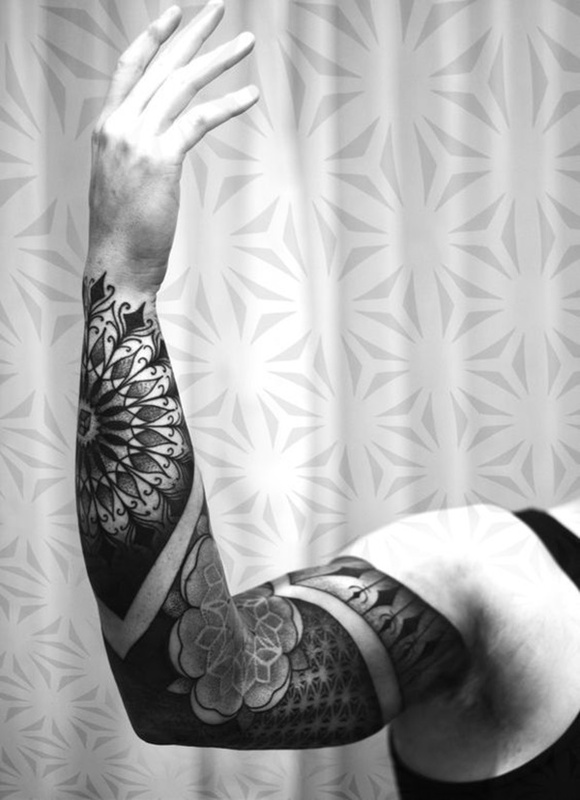 This black and grey piece displays faint shading to create silhouettes and dotwork details. The upper mandala has a floral focal point, while the lower mandala has a cubist design on its center. 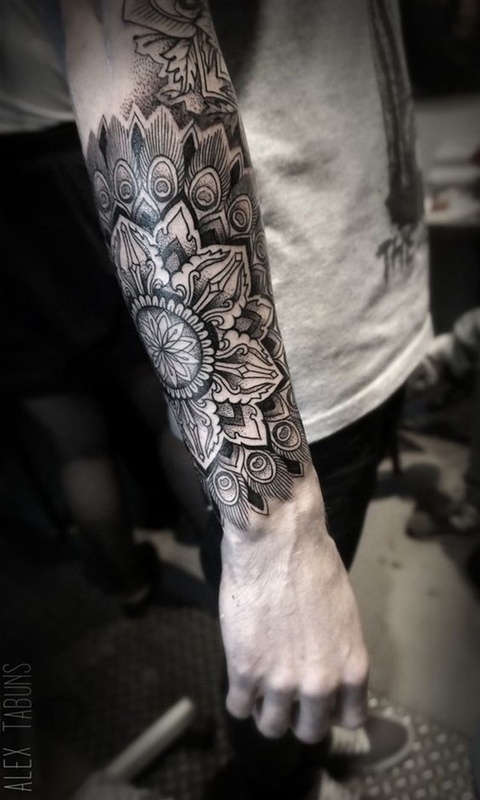 This mandala arm sleeve fuses black and grey, dotwork, and line work techniques. 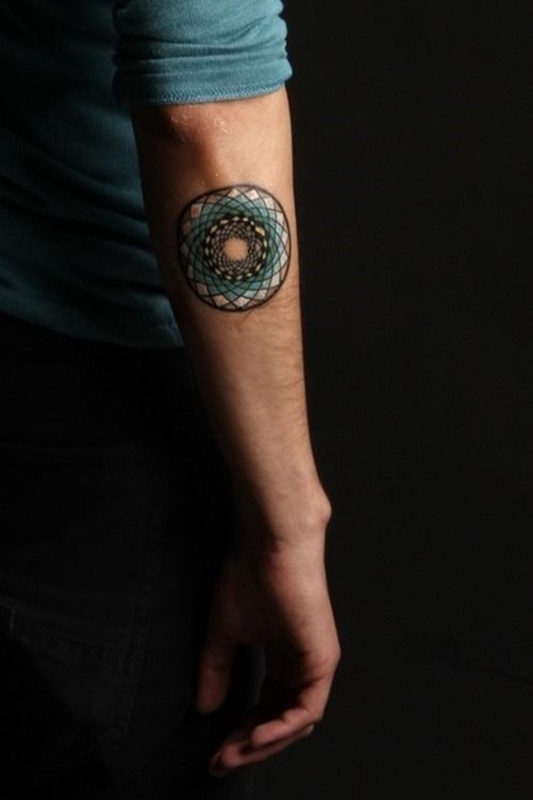 Exhibiting a modern style, this tattoo is inked in dark blue and light blue tones. 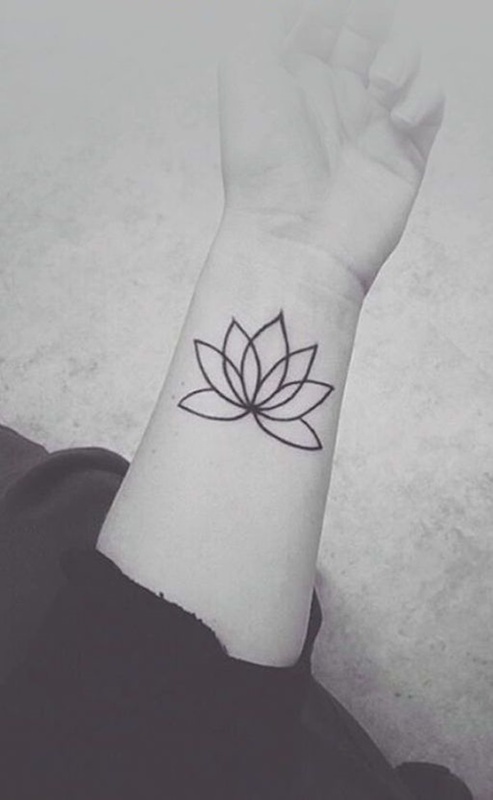 The tattoo is fully shaded and shows a simple, minimalist design. If simplicity is up your alley, this minimalist design is a perfect choice. 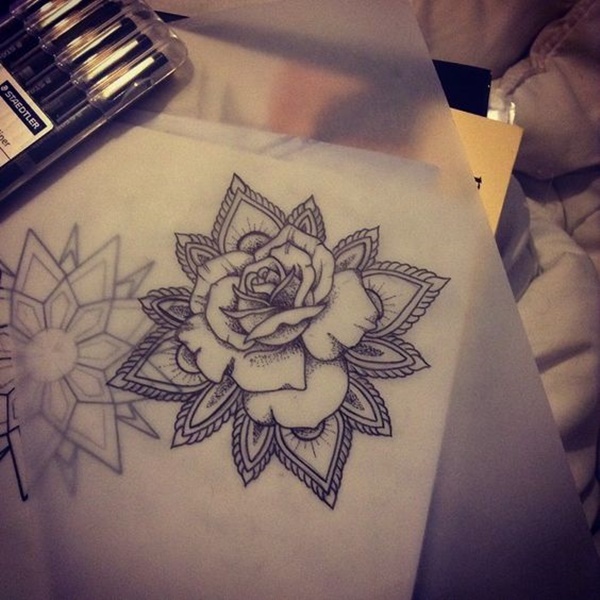 Multiple petals overlap each other, creating the outline of a lotus bloom. 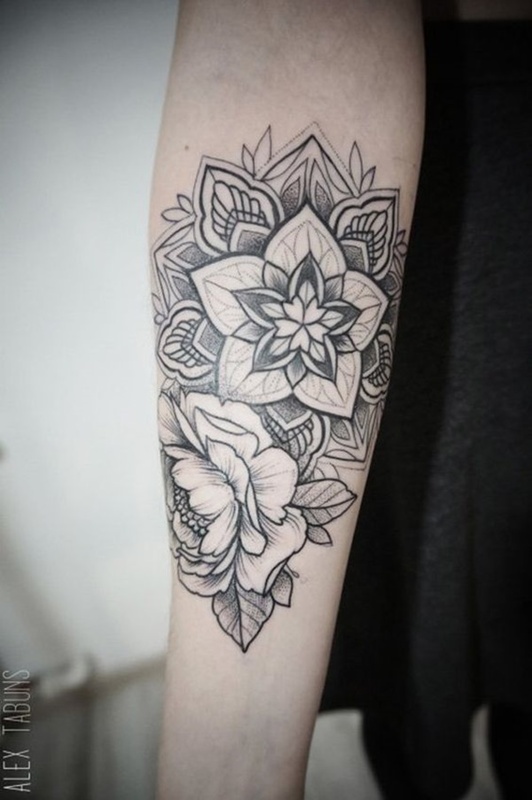 Black line work distinguishes the exterior petals, while a geometric focal point complements the surrounding black and grey circle. 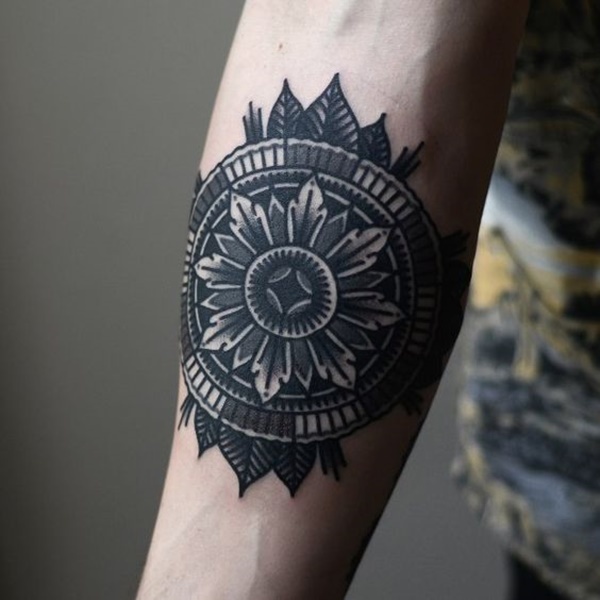 Foregoing the typical floral mandala elements, this tattoo showcases a geometric design with a clear circular black outline. The interior is inked in white, blue, and black hues. 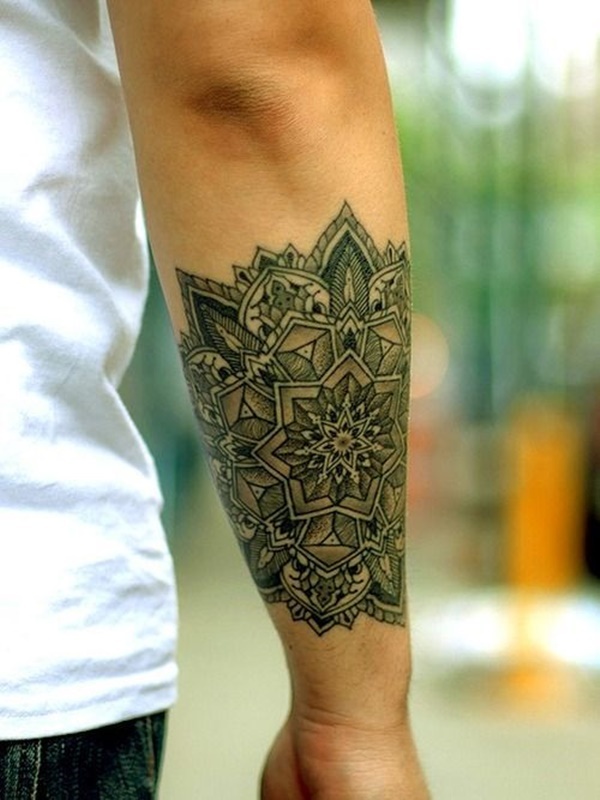 Arrow-shaped dotwork details accentuate the upper mandala, while the lower arm features blackwork tattooing. 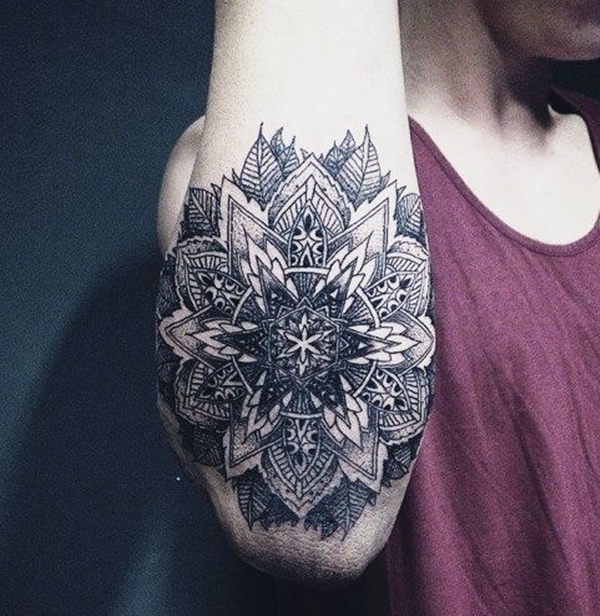 Like most mandalas, this tattoo is created using dotwork and black and grey techniques. 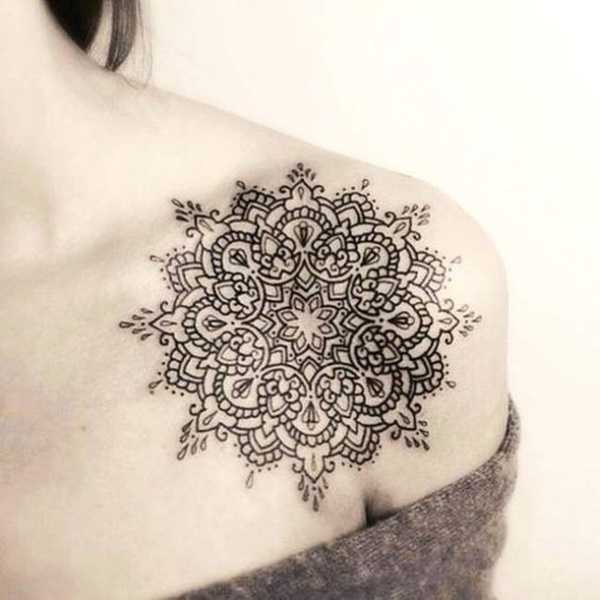 Dotwork is a perfect tattoo style for mandala designs, as it creates elaborate, meticulously detailed tattoos that bring out the beauty of mandalas. 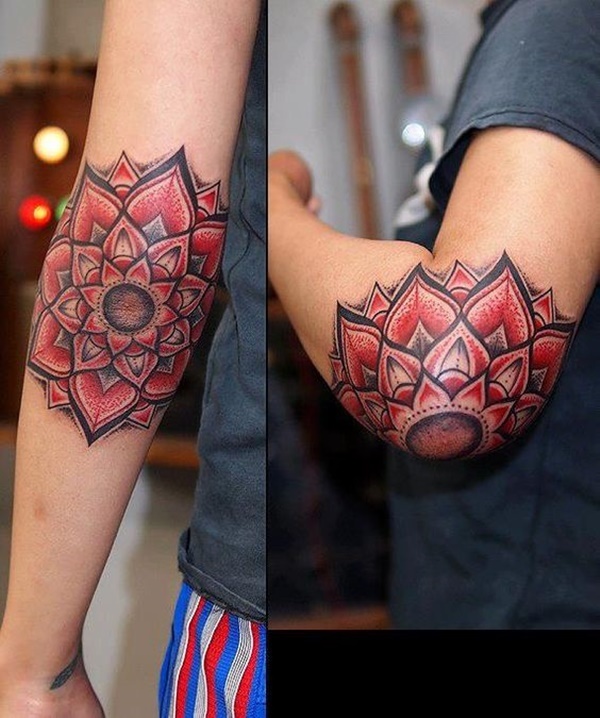 The upper mandala is predominantly inked in red tones, while the lower mandala is shaded in black, creating a stark contrast. Inked on the flank area, this tattoo is easy to hide with clothing and looks alluring when shown off with cropped tops or beachwear. 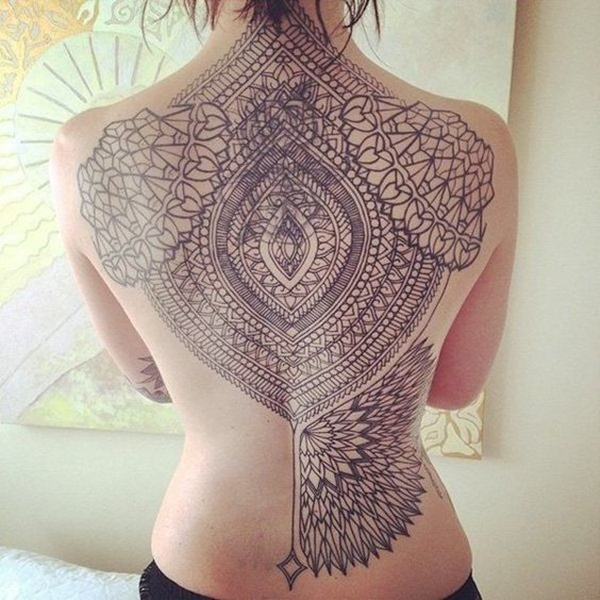 Curved lines define the beauty of this line work mandala, which looks well positioned on the back. 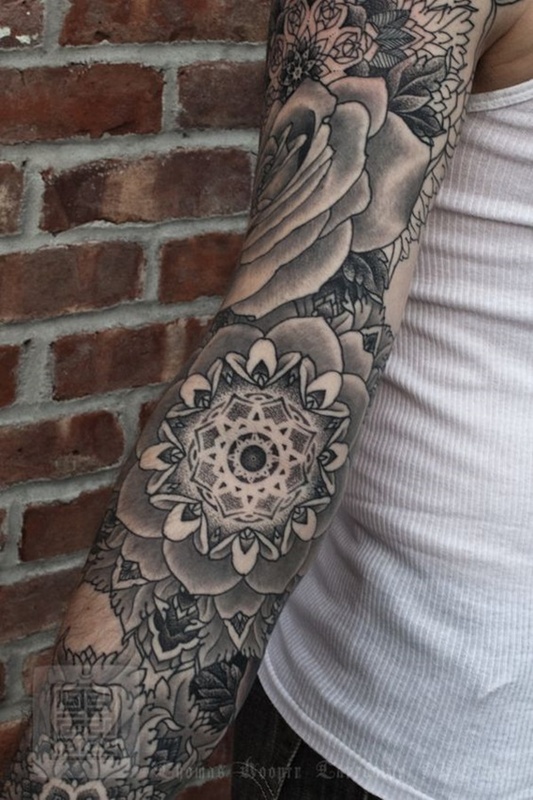 This black and grey mandala infuses tribal design elements to create a distinctive style. 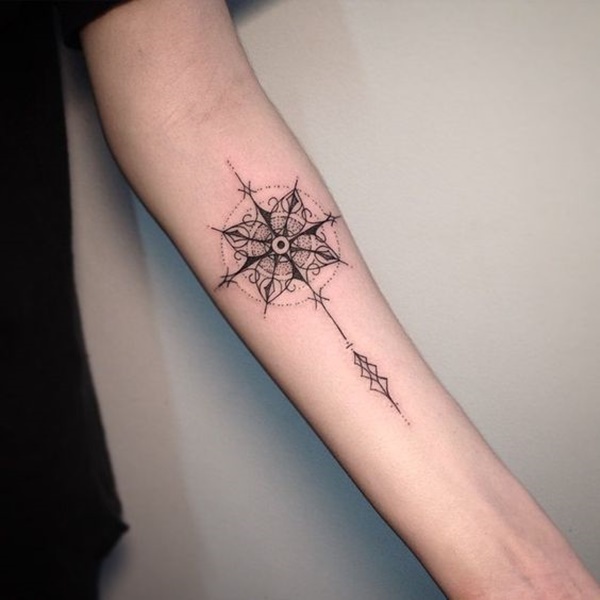 This blackwork mandala has portions that are left non-inked. Faint dotwork can be seen on the petals. 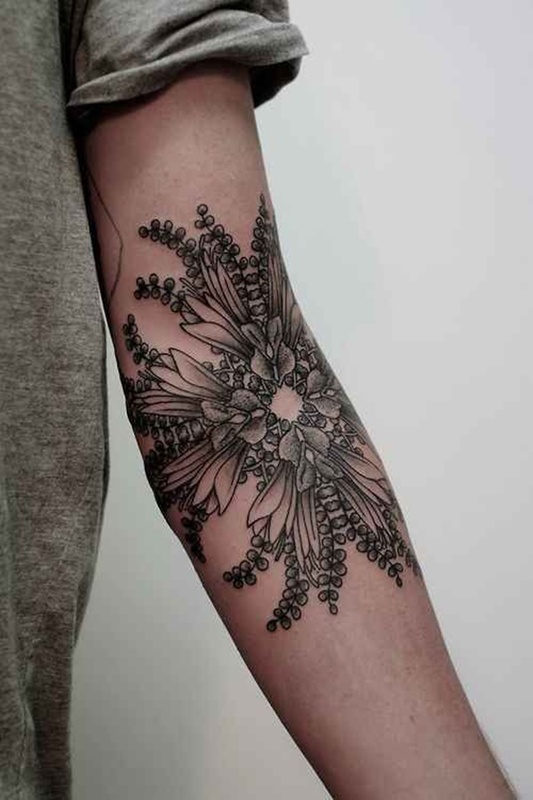 Leaves surround the circle, and bold tones make this blackwork tattoo stand out. 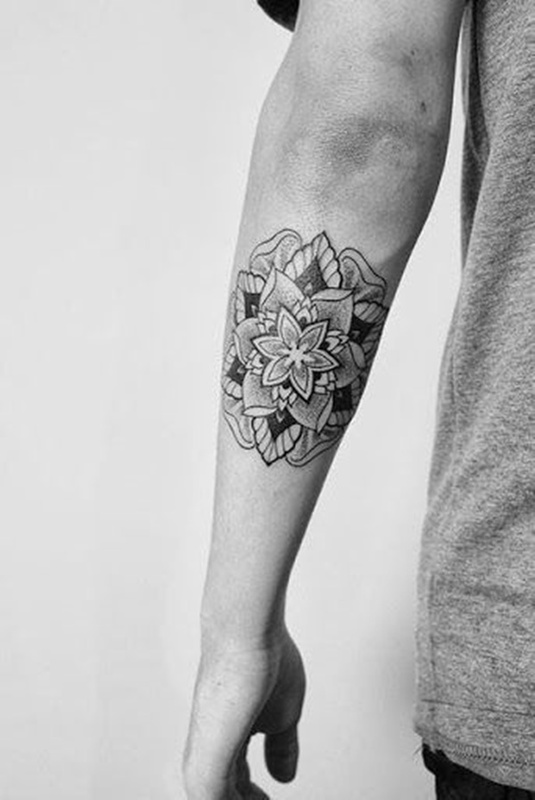 The perfectly symmetrical design looks outstanding, and the black line work style emphasizes the complex details of this tattoo. On the lower right side, a pointed geometric pattern lends a touch of disarray to the proportional look. 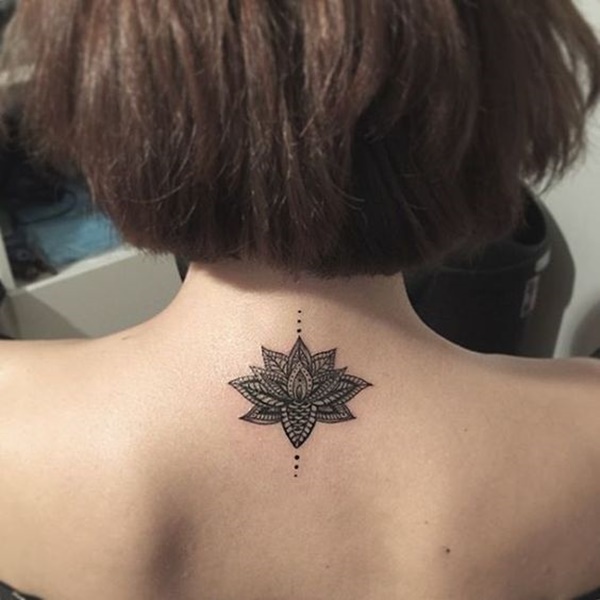 Bold lines and thin lines characterize this stunning shoulder tattoo. 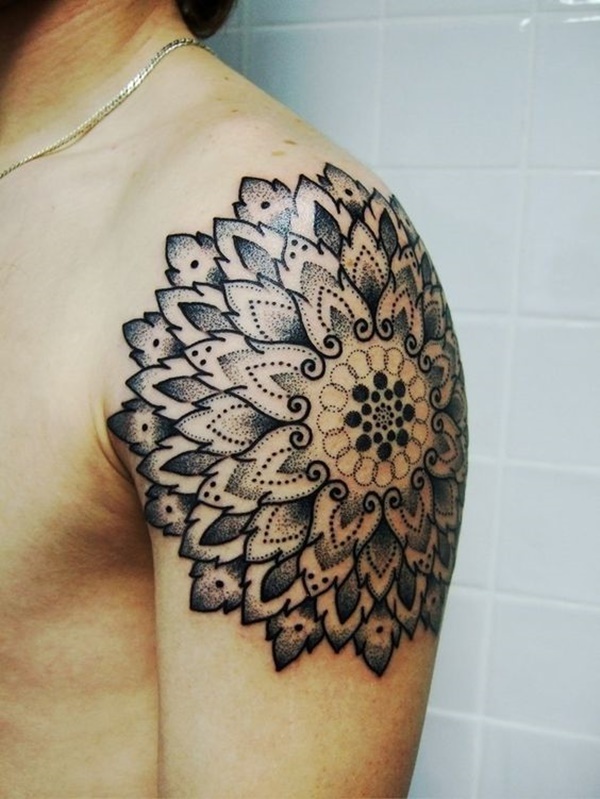 This shoulder mandala looks like a short sleeve because of the straight-lined edge down the arm, and it extends to the upper right area of the back with a standalone mandala. 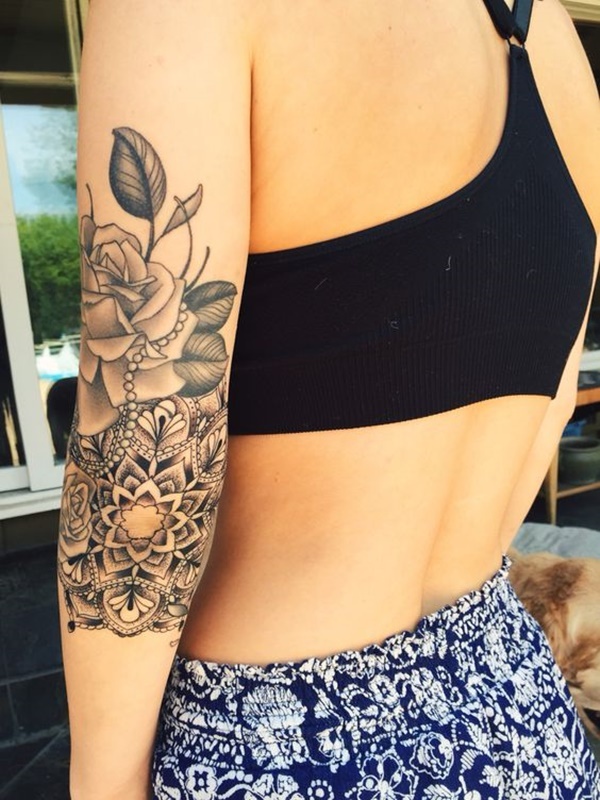 This lovely tattoo shows off ornate line work and bold shading. Some women like to have their abdomen inked, with the tattoo running along the shape of their chest. Abdomen tattoos undoubtedly look seductive, and they enhance a woman’s charm. 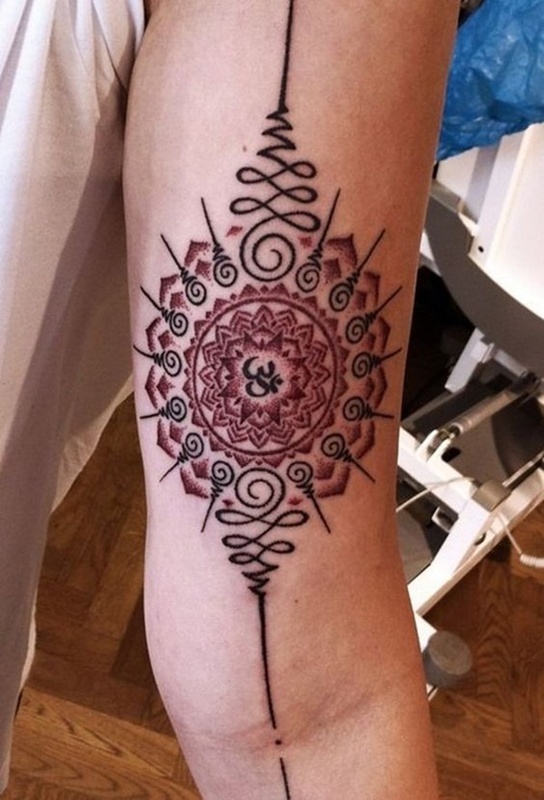 Another incredibly alluring tattoo, this mandala beautifies the thigh and leg areas. Dotwork shading creates soft silhouettes on the petals. 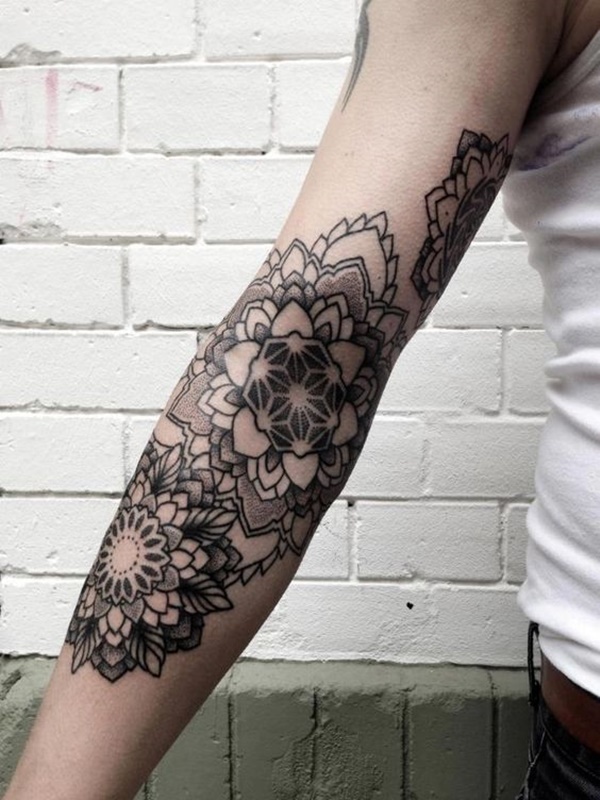 A thick, bold outline defines the floral shape of this mandala, while dotwork detailing creates an intricate design. 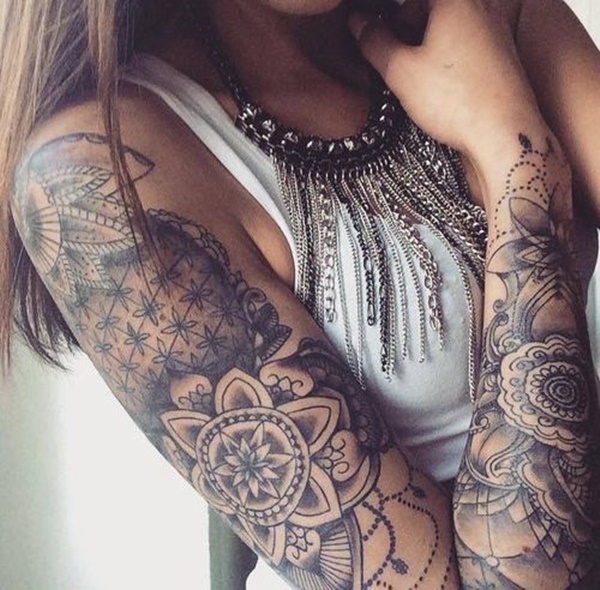 Many women love to have their shoulders tattooed, as it’s easy to show off or conceal their tattoos depending on their clothes. 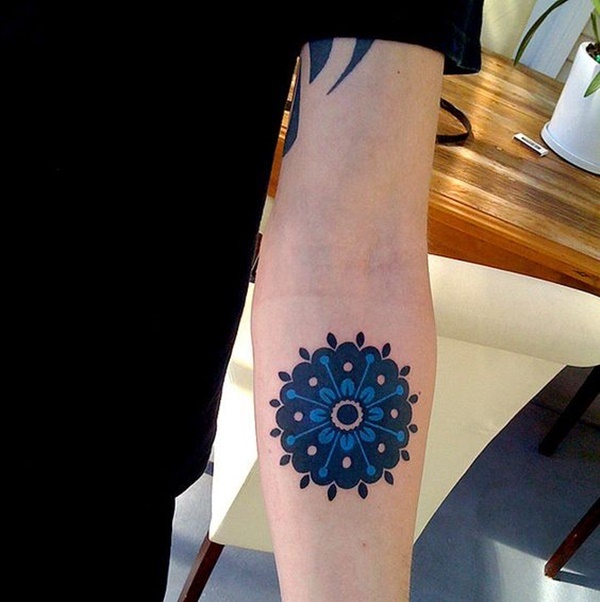 To complement the blue flowers above this mandala, the geometric focal point and the outline of several petals are shaded in blue. Multiple leaves surround this visually arresting mandala. 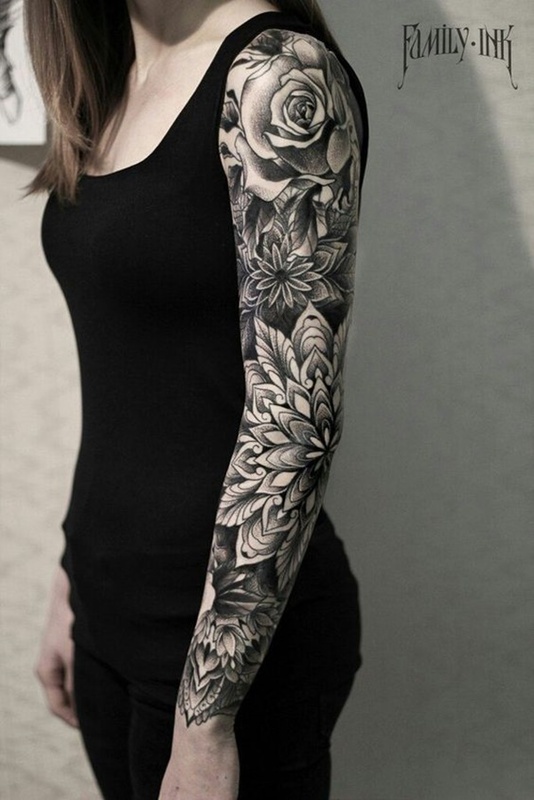 Rather than a dark blackwork tattoo, this full arm sleeve features a combination of line work, dotwork, and black and grey techniques. 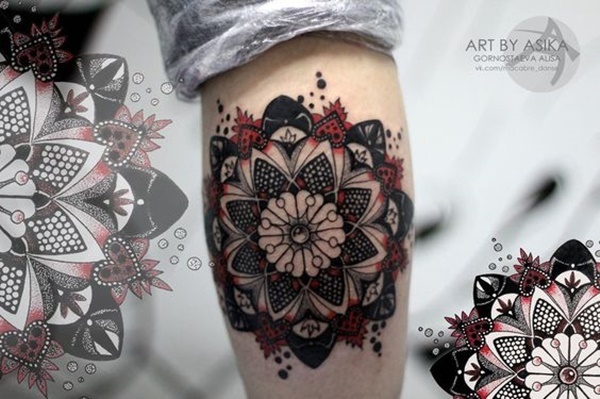 Featuring a modern take on the classical mandala design, this tattoo uses red and black tones and looks eye-catching. Sprouting from the central lotus bloom are leaves and fern-like plants, creating a unique mandala design. 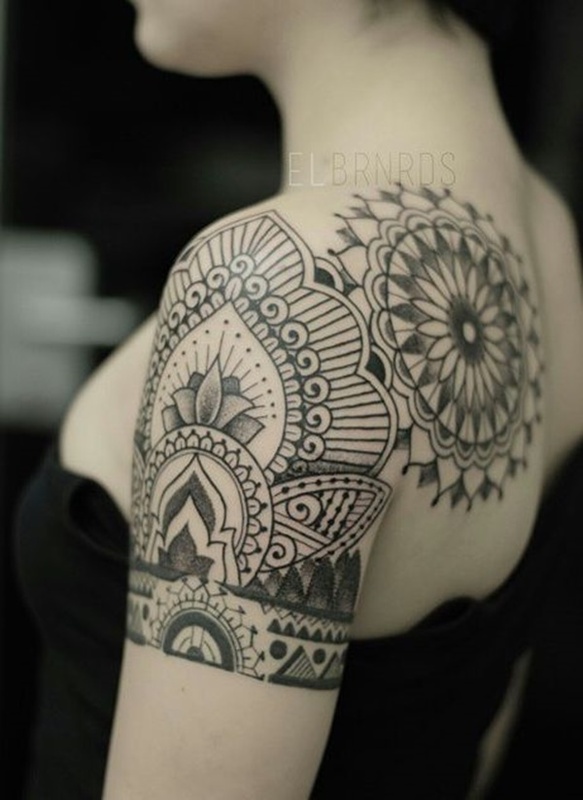 Geometric patterns are conspicuous on this mandala tattoo. 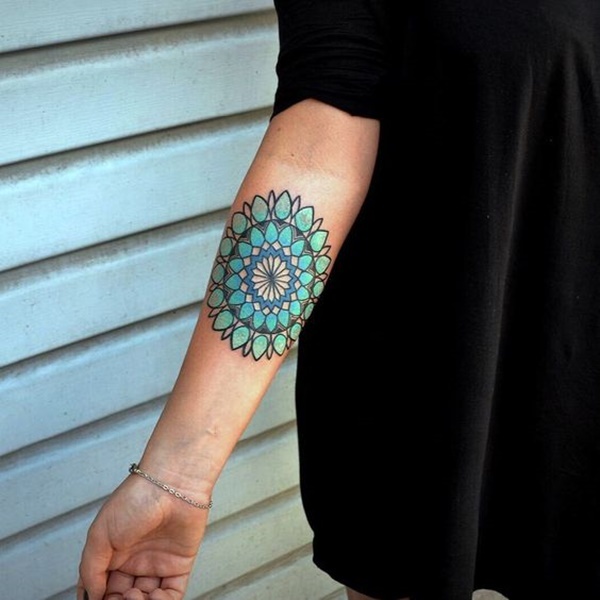 The use of proportional shapes makes mandala designs look quite pleasing to the eye. Mandalas are believed to represent the universe, and they serve as a microcosm of the universe. 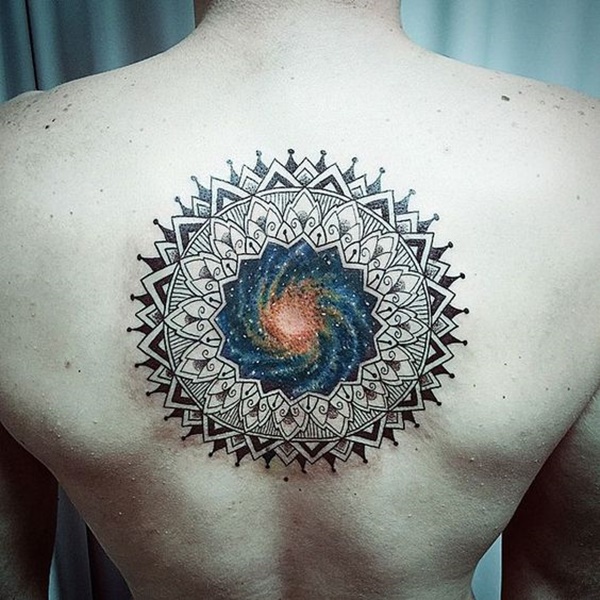 This tattoo perfectly expresses the meaning of a mandala by depicting a colored image of the universe in its focal point. 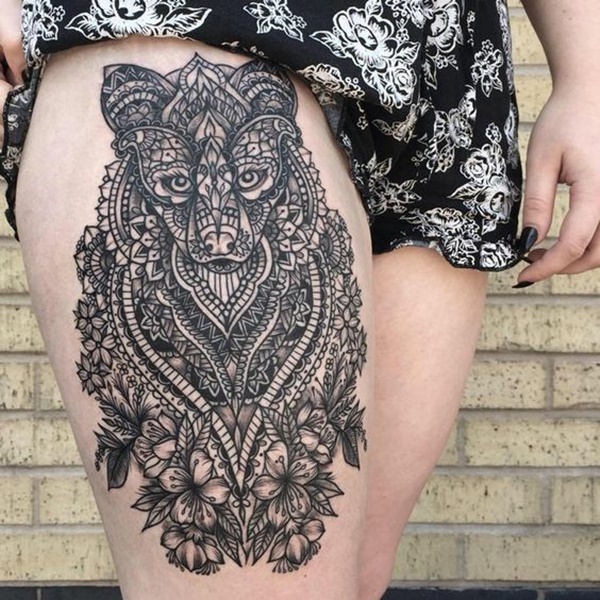 If you believe you have a spirit animal that matches your personality, it’s an excellent idea to personalize your tattoo by turning it into the shape of your favorite animal. The tattoo above has floral elements all around for a feminine touch. 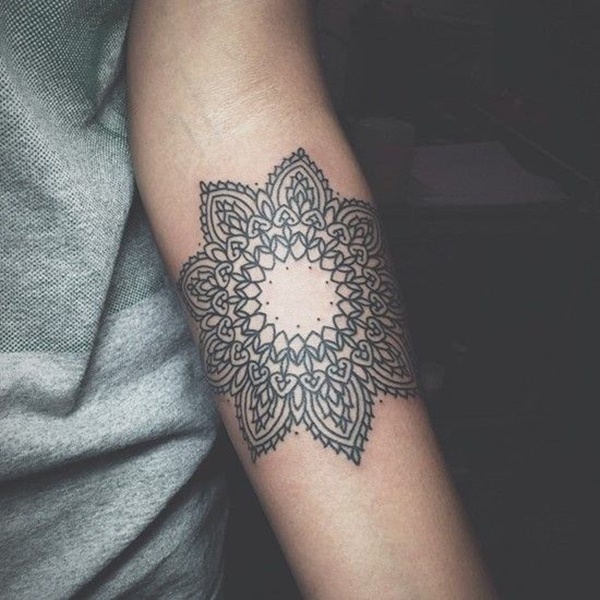 Black dotwork circles as well as fully shaded circles lie in the center of this floral mandala. 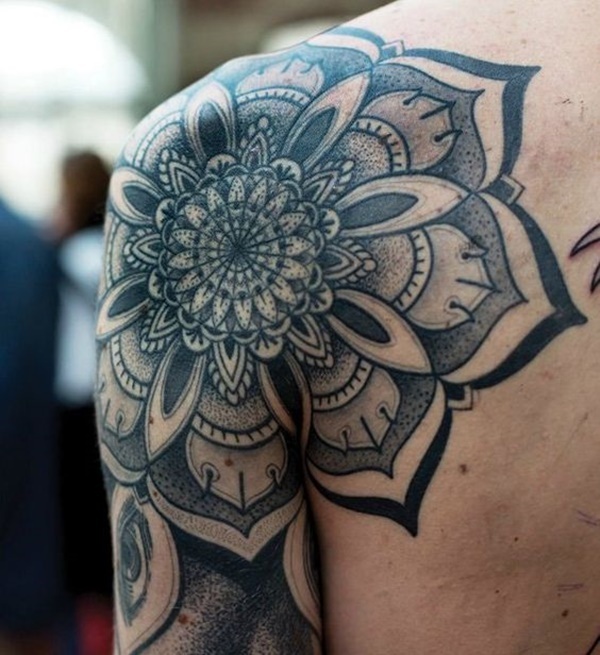 The petals are also shaded with dotwork details. 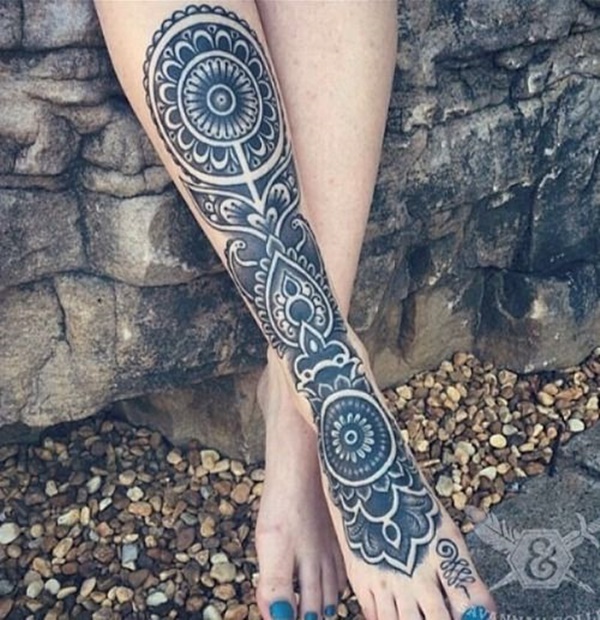 Bold shading makes this leg mandala tattoo look striking and appealing. 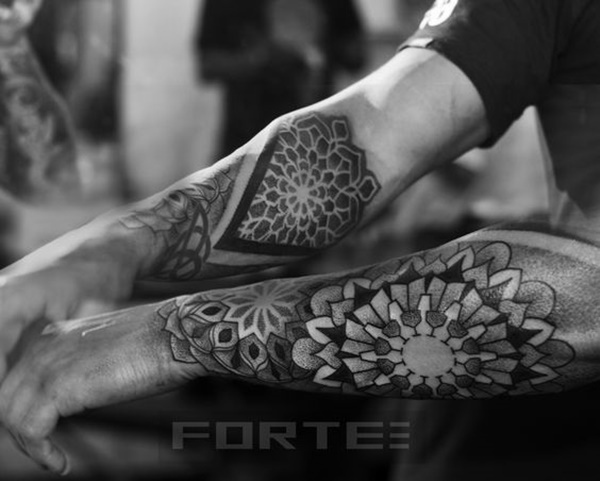 Mandalas on both arms complement each other and create a cohesive theme. The Yin Yang symbol depicts perfect balance, and it shows how two opposite forces go well together to form a whole. 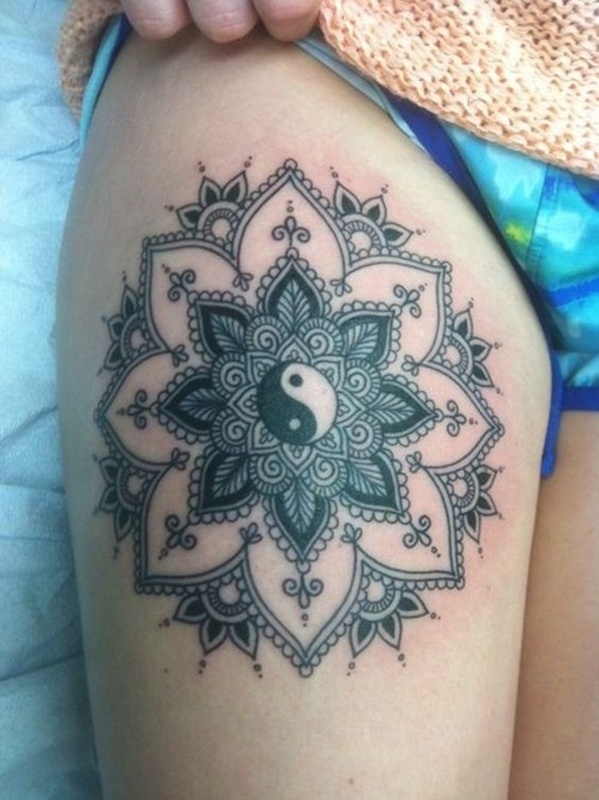 The fusion of the Yin Yang and mandala symbols adds deeper meaning to spirituality and harmony. 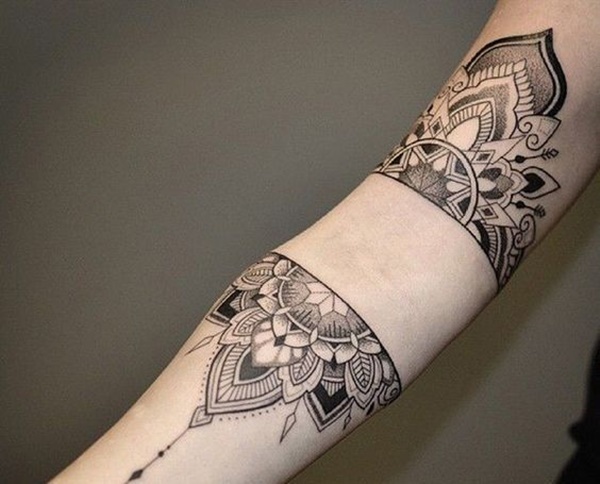 Like a large bangle, this tattoo looks like a large wrist accessory that instantly beautifies the arm. 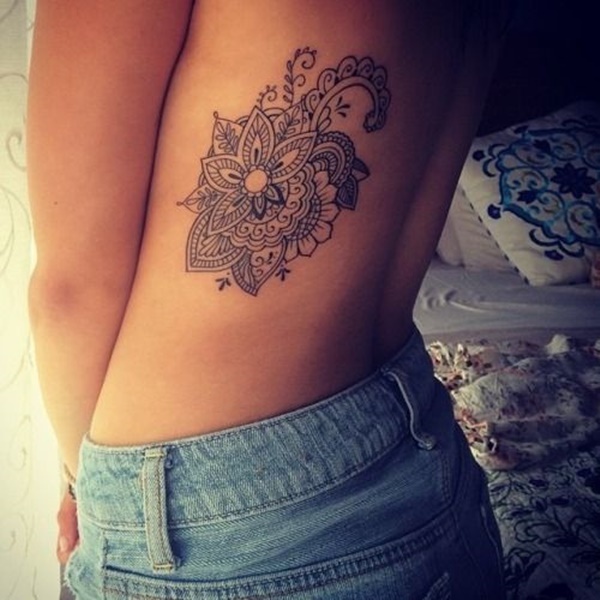 The back area is one of the most ideal body parts for mandala tattoos, as it provides a flat canvas that portrays the full circular beauty of a mandala. 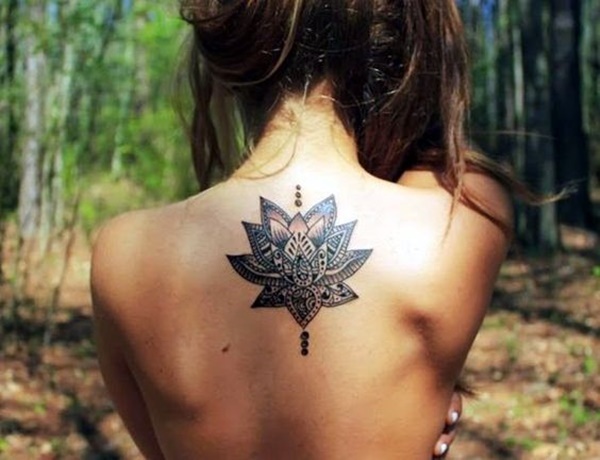 This tattoo completely takes the shape and appearance of a flower while maintaining a sense of proportion. 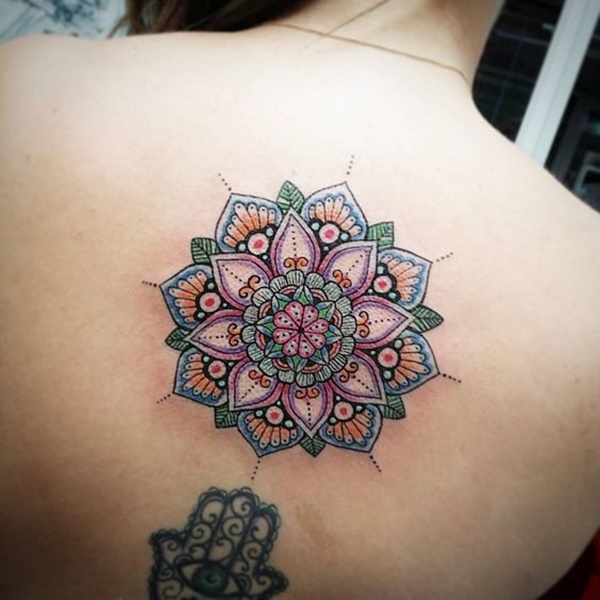 Green, orange, pink, and blue colors liven up this mandala and give it a refreshing look. 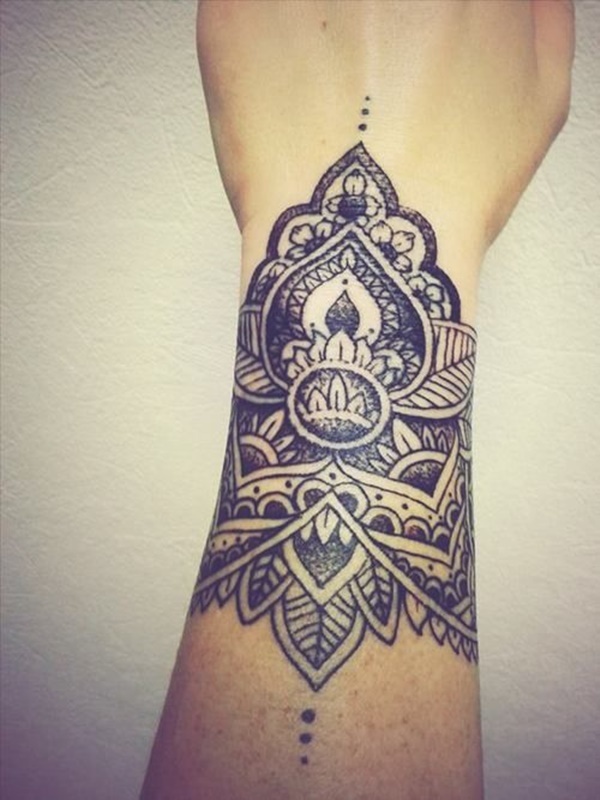 A complementary Hamsa symbol, which consists of an eye on the palm of a hand, lies below the mandala. 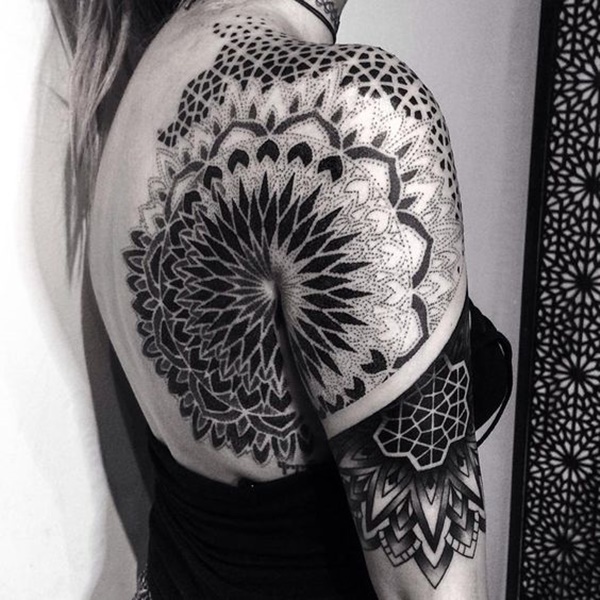 This beautiful mandala is inked using line work style. 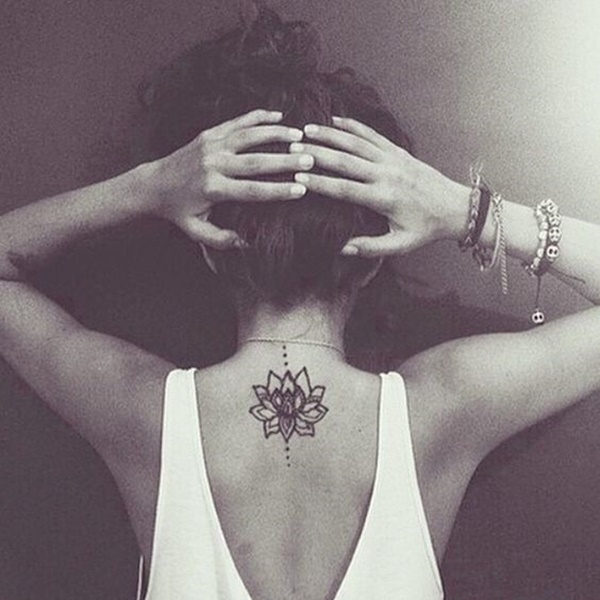 Positioned near the nape, this simple lotus bloom tattoo gives off a dainty appeal. 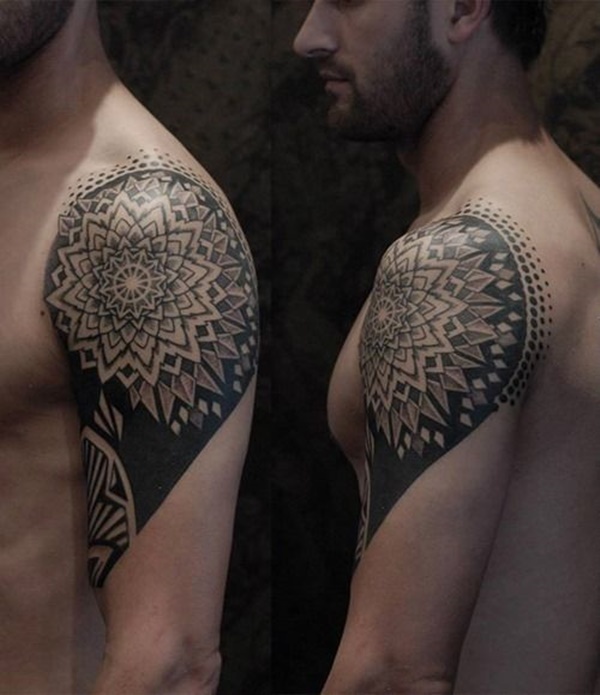 Geometric patterns dominate this tattoo, which extends toward the upper left chest. 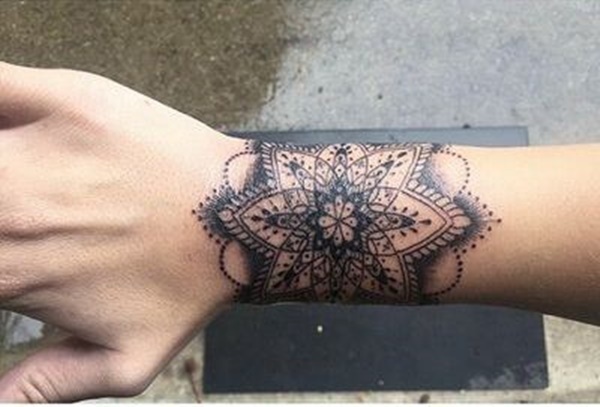 This charming wrist tattoo shows half of a mandala. 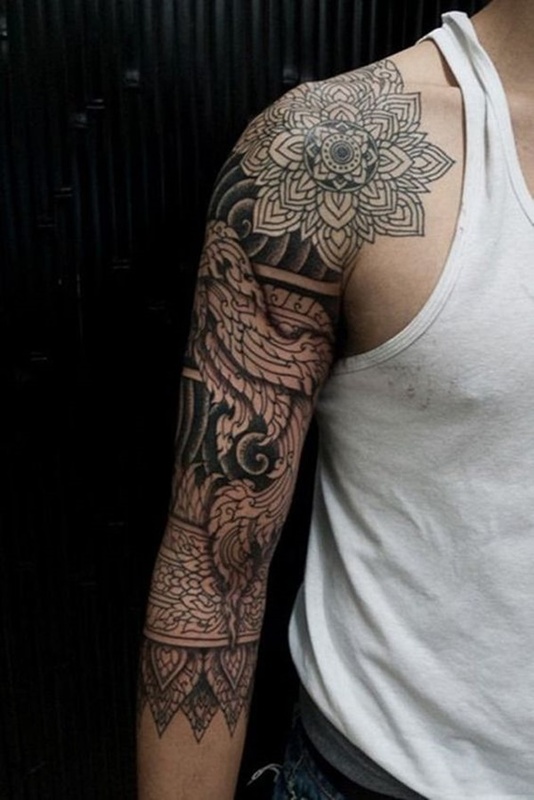 Multiple mandalas cover the forearm and upper arm. 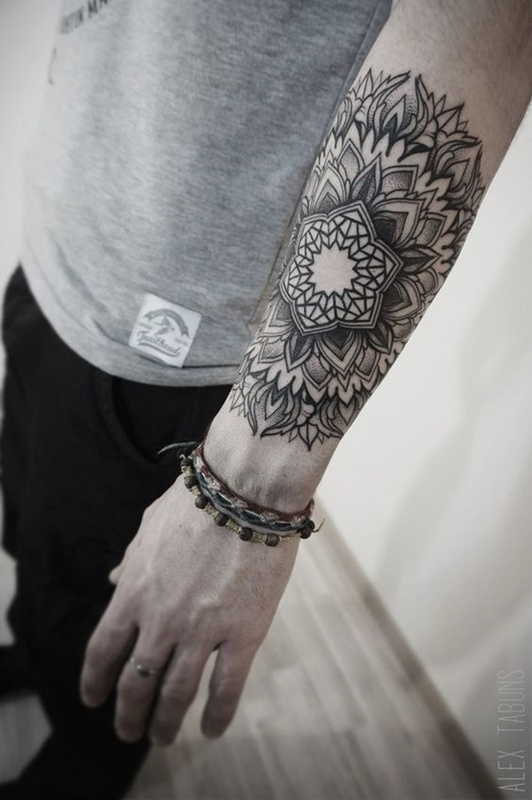 The two halves of a mandala are separated and inked on both forearms for a touch of creativity. Some of the inner petals are shaded in red tones. 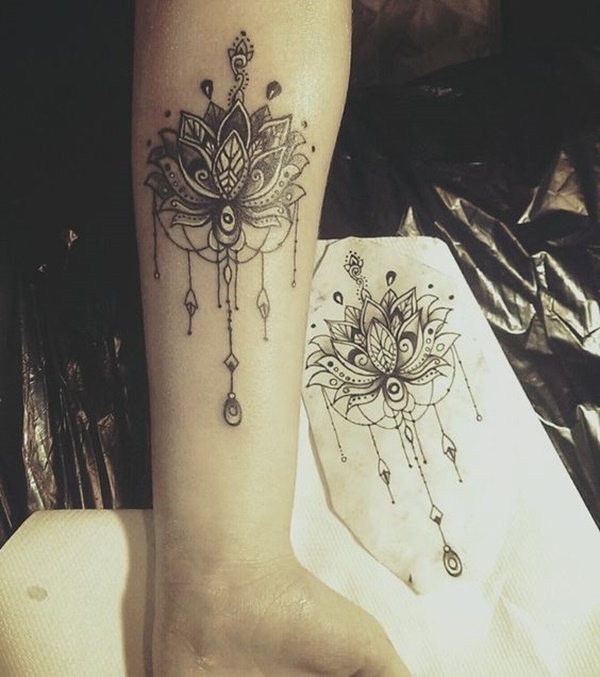 This gorgeous ornamental tattoo features dotwork bead accents which seemingly look like they’re suspended from the V-shaped outline. 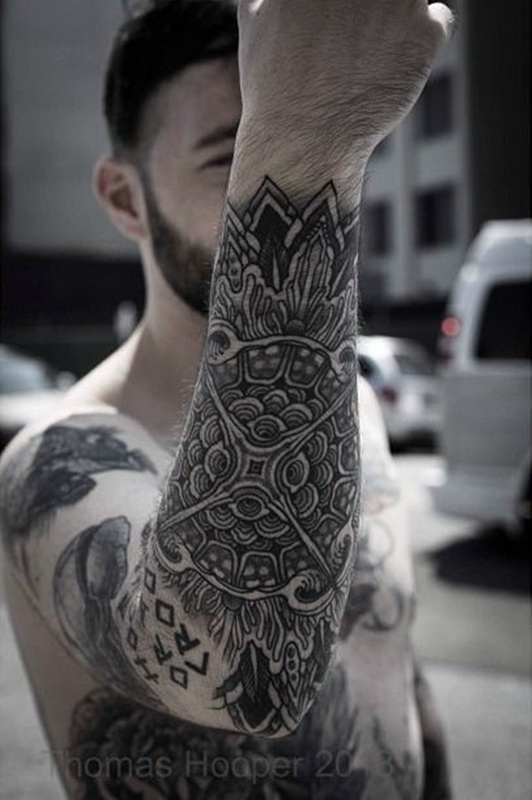 A diagonal line defines the edge of this blackwork tattoo, which is inked on the upper arm. 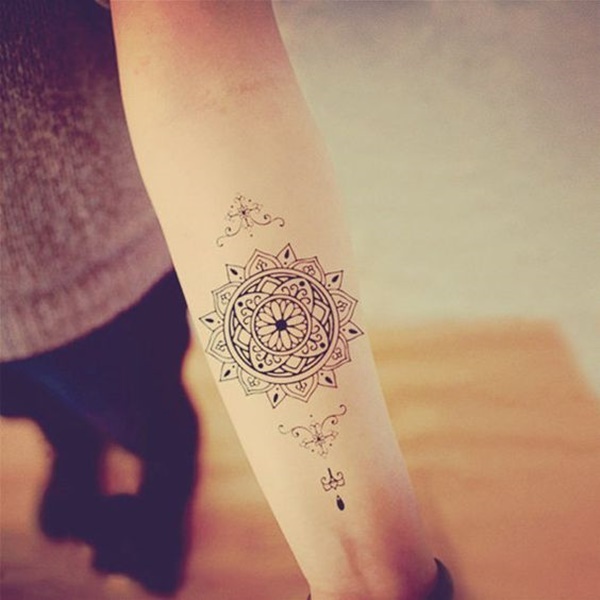 This glamorous mandala adorns the forearm and lends an artistic appeal to the tattoo wearer. 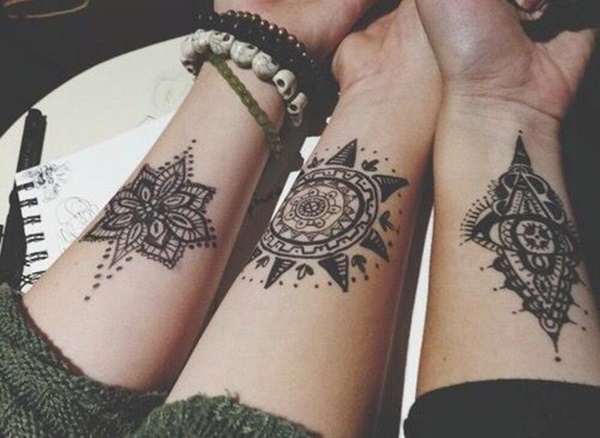 If you and your friends want to share a common element that binds your friendship, these mandala designs are wonderful options. 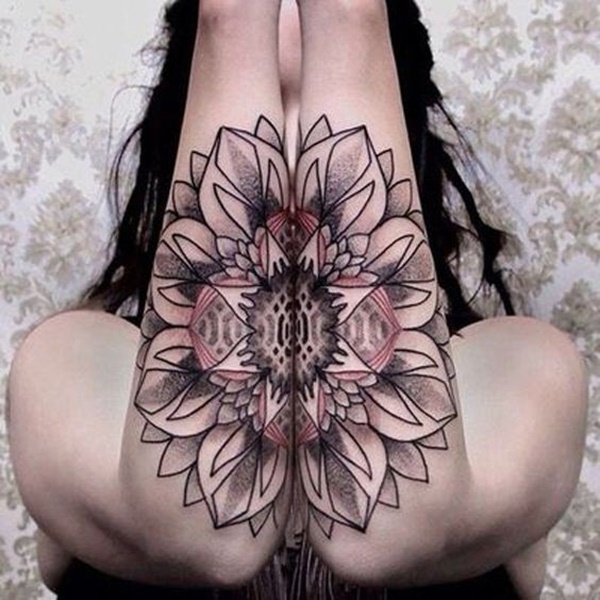 Three distinctive mandala tattoos complement each other. 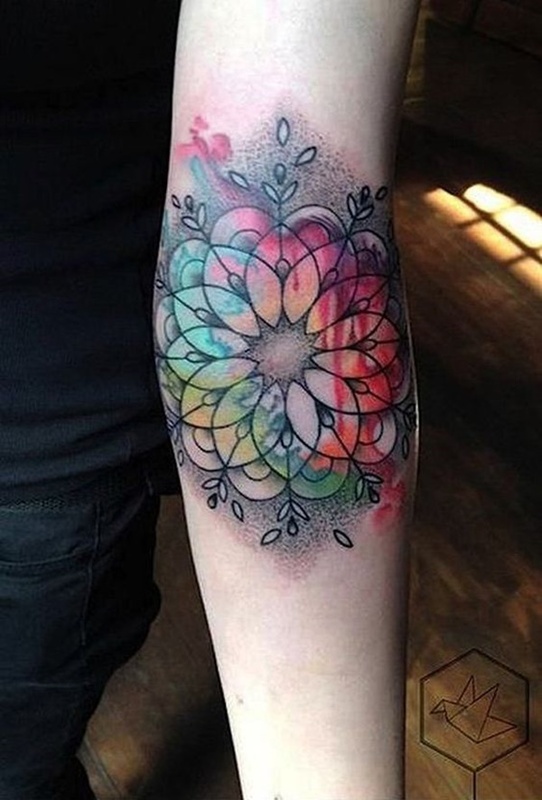 A splash of red, green, and yellow colors makes this geometric mandala tattoo look dazzling and awe-inspiring. 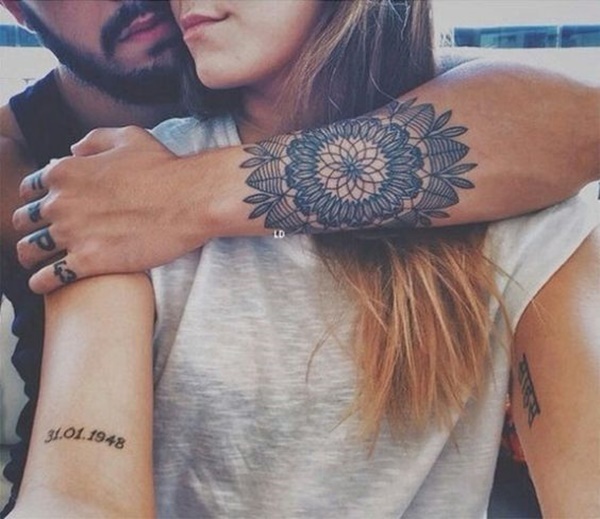 Tattoos look extra seductive when placed on the thigh. 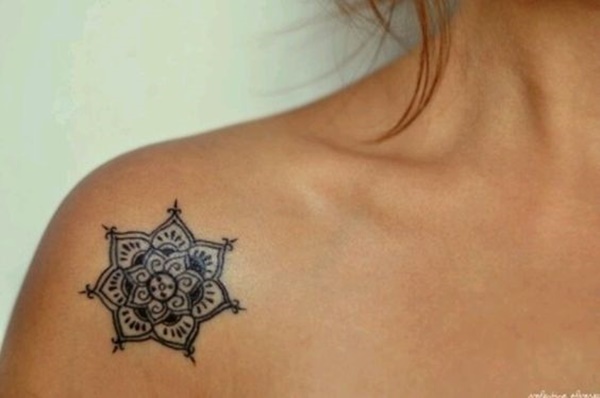 A small, charming mandala is ideal for individuals who like designs that are less conspicuous. 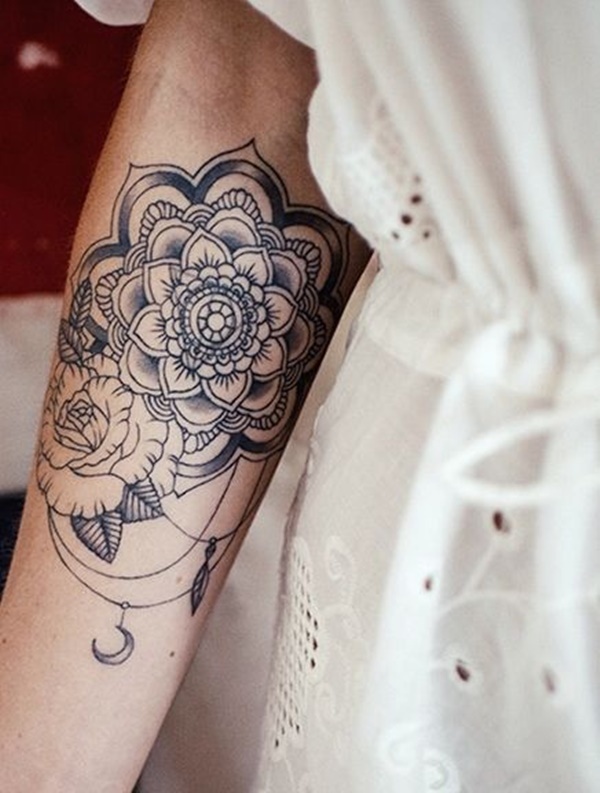 A pretty flower lies in the middle of this mandala design. Floral elements somehow soften the look of a bold design and infuse a feminine quality. 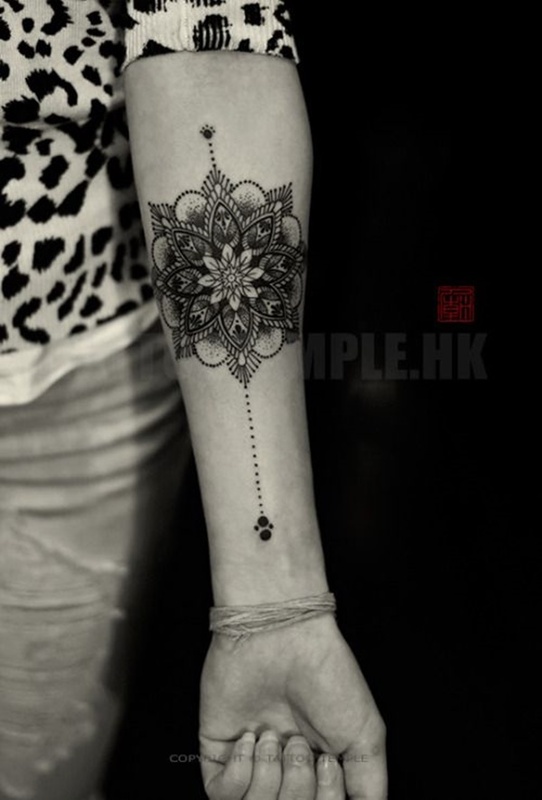 Wrapping around the wrist, this black mandala looks like a large piece of accessory. 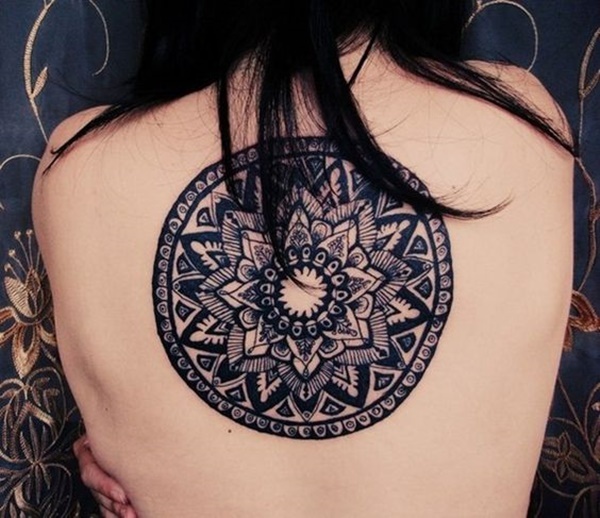 The full roundness of the mandala is completed by inking half of the design on the shoulder and the other half on the back. 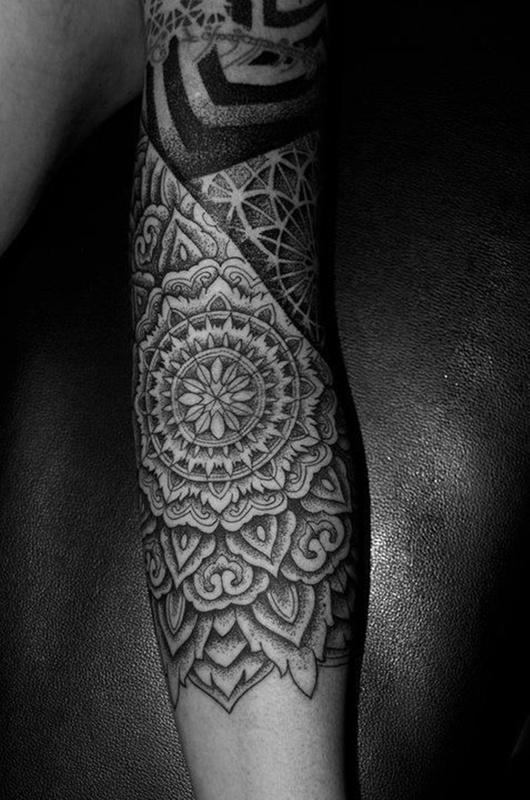 Only half of the mandala is inked on the forearm and hand, and dotwork shading looks quite prominent. 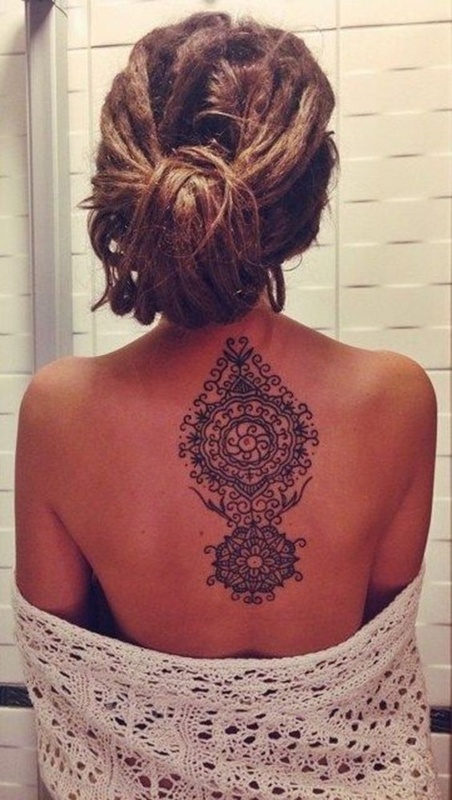 The blackwork tattoo embellishes the back and lies right in the middle to convey a sense of balance and symmetry.